4 Canción de ser Practicamos Traduzcan al español. 1.) I am tall. 2.) Are you intelligent? 3.) My friend is from Texas. 4.) We are students. 5.) They are pretty. 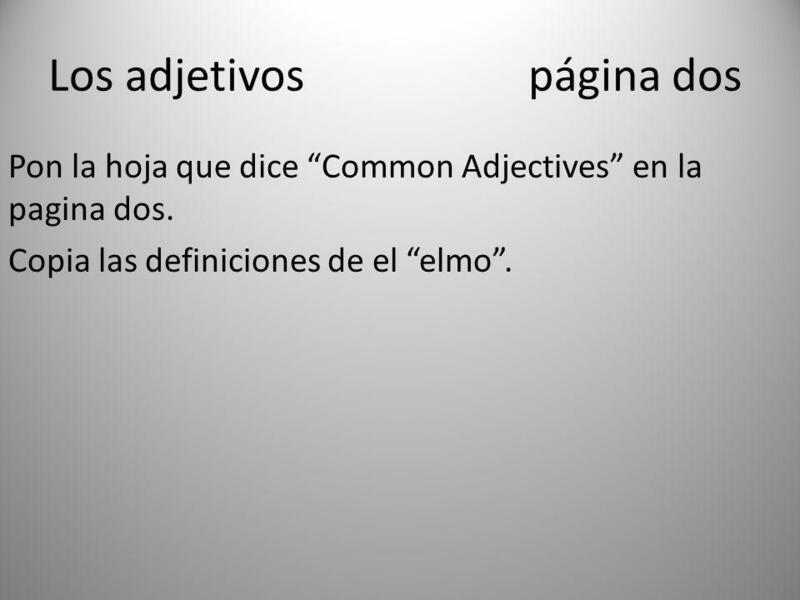 Pon la hoja que dice “Common Adjectives” en la pagina dos. Copia las definiciones de el “elmo”. Pon la hoja que dice “Adjective Agreement” detrás. 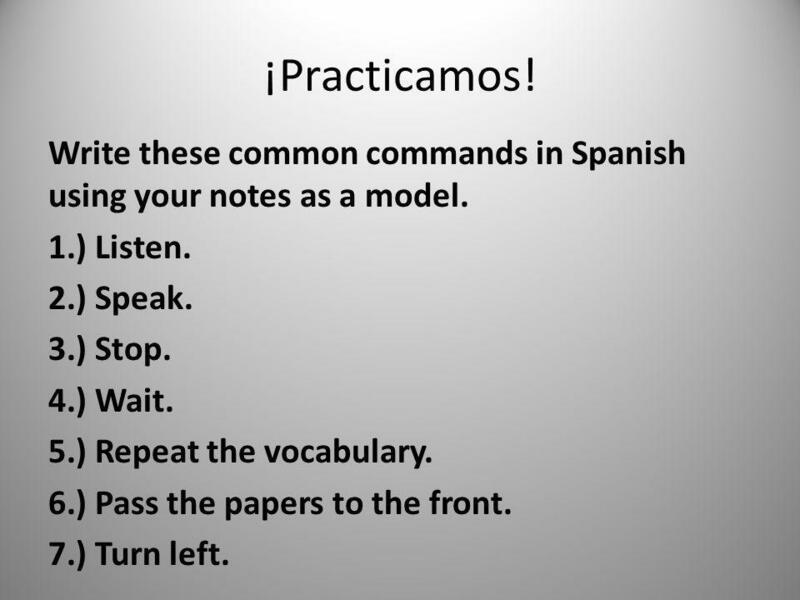 ¡Practicamos! 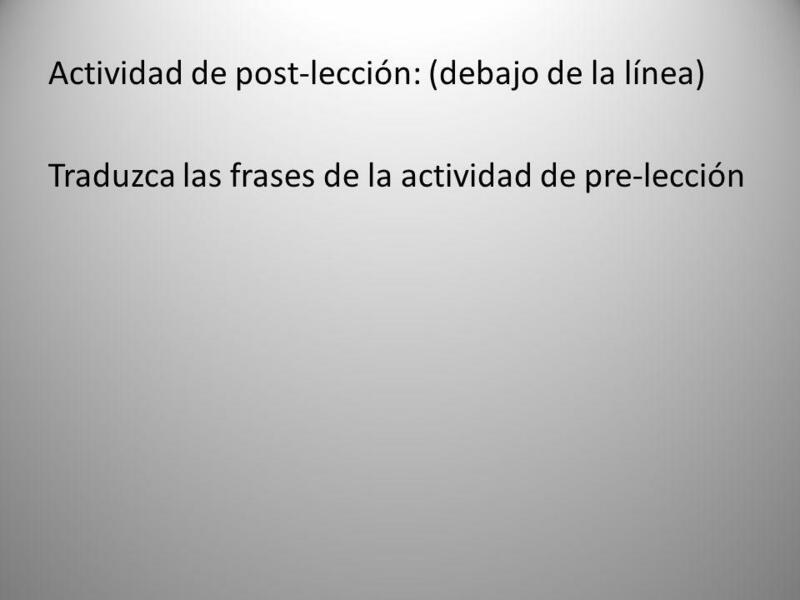 Escribe la frase y escribe el adjetivo en español. Ex. Stacey es (nice). 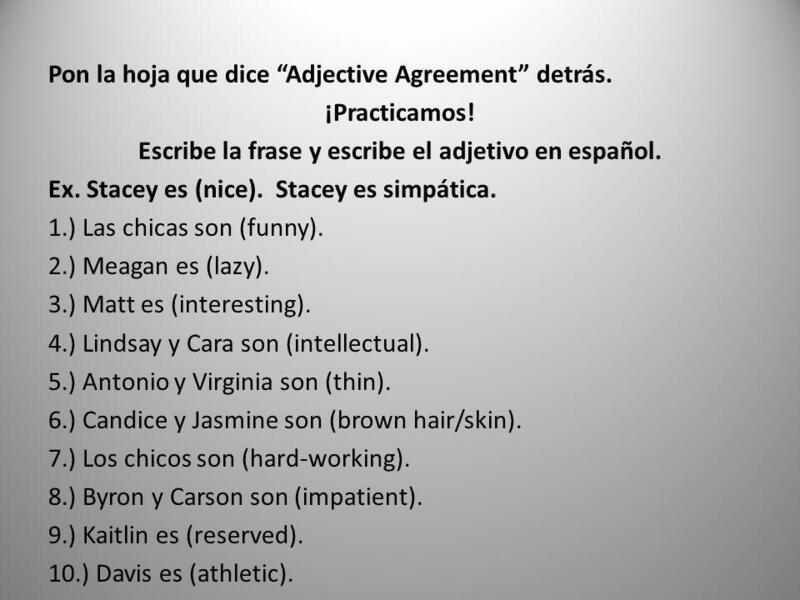 Stacey es simpática. 1.) Las chicas son (funny). 2.) Meagan es (lazy). 3.) Matt es (interesting). 4.) Lindsay y Cara son (intellectual). 5.) Antonio y Virginia son (thin). 6.) Candice y Jasmine son (brown hair/skin). 7.) Los chicos son (hard-working). 8.) Byron y Carson son (impatient). 9.) Kaitlin es (reserved). 10.) Davis es (athletic). 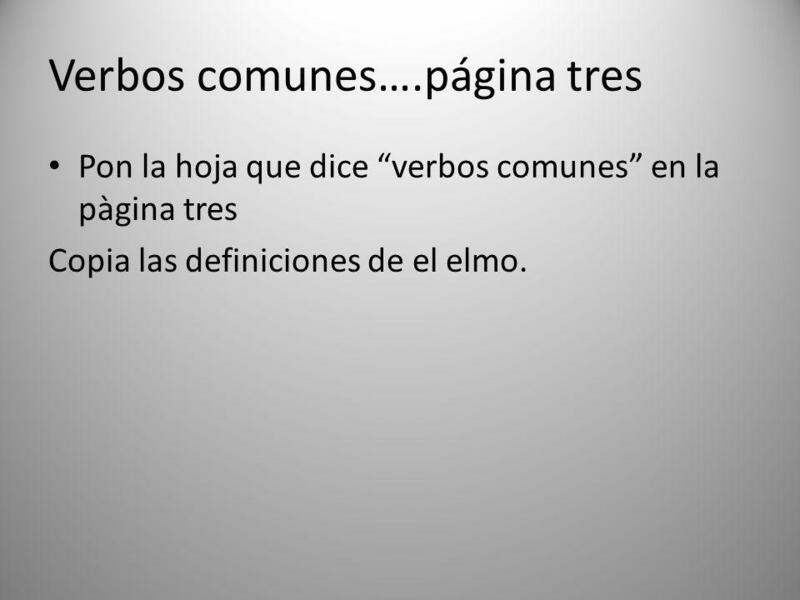 Pon la hoja que dice “verbos comunes” en la pàgina tres Copia las definiciones de el elmo. 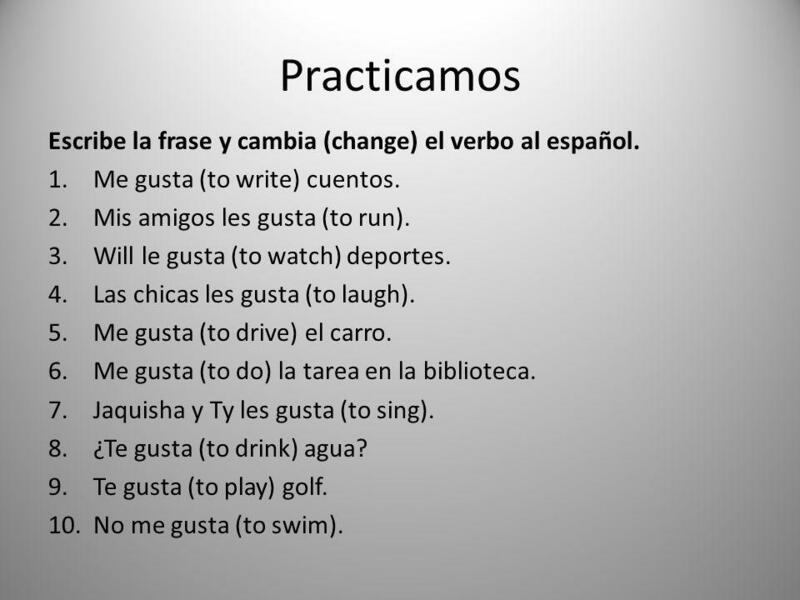 8 Practicamos Escribe la frase y cambia (change) el verbo al español. 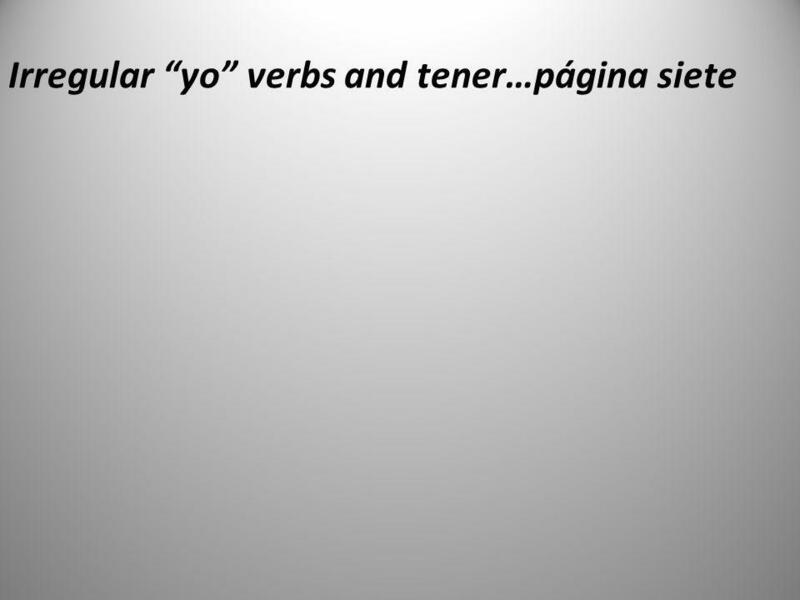 Me gusta (to write) cuentos. Mis amigos les gusta (to run). Will le gusta (to watch) deportes. Las chicas les gusta (to laugh). Me gusta (to drive) el carro. Me gusta (to do) la tarea en la biblioteca. Jaquisha y Ty les gusta (to sing). ¿Te gusta (to drink) agua? Te gusta (to play) golf. No me gusta (to swim). 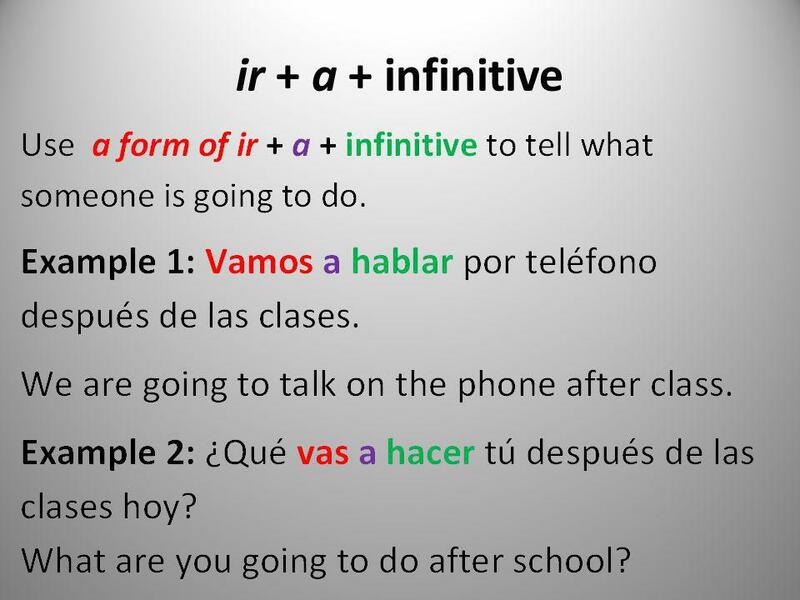 A verb in it’s original form is called an infinitive. 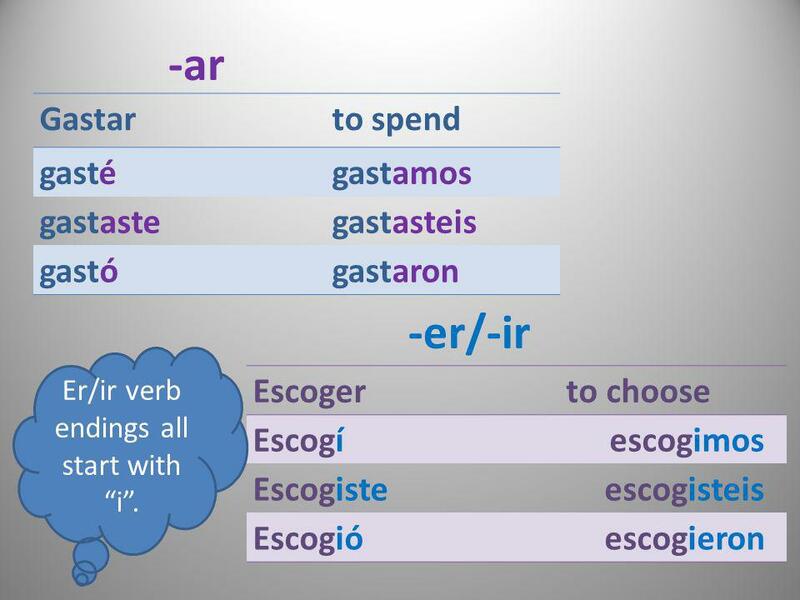 There are three infinitive (verb) endings in Spanish--ar, -er, and -ir. 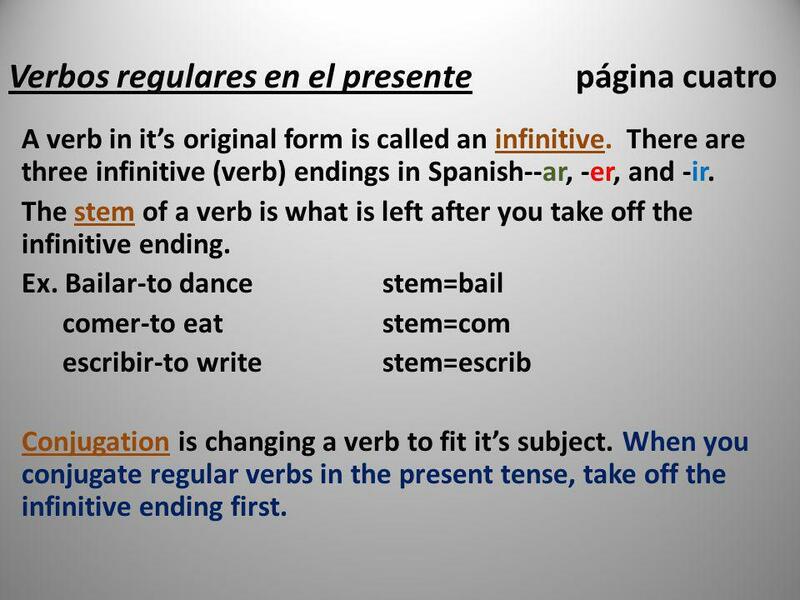 The stem of a verb is what is left after you take off the infinitive ending. Ex. 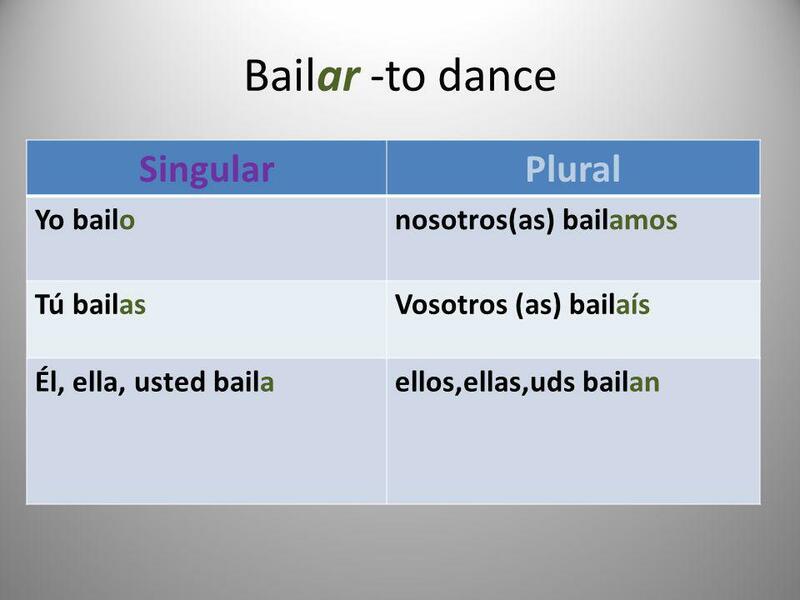 Bailar-to dance stem=bail comer-to eat stem=com escribir-to write stem=escrib Conjugation is changing a verb to fit it’s subject. 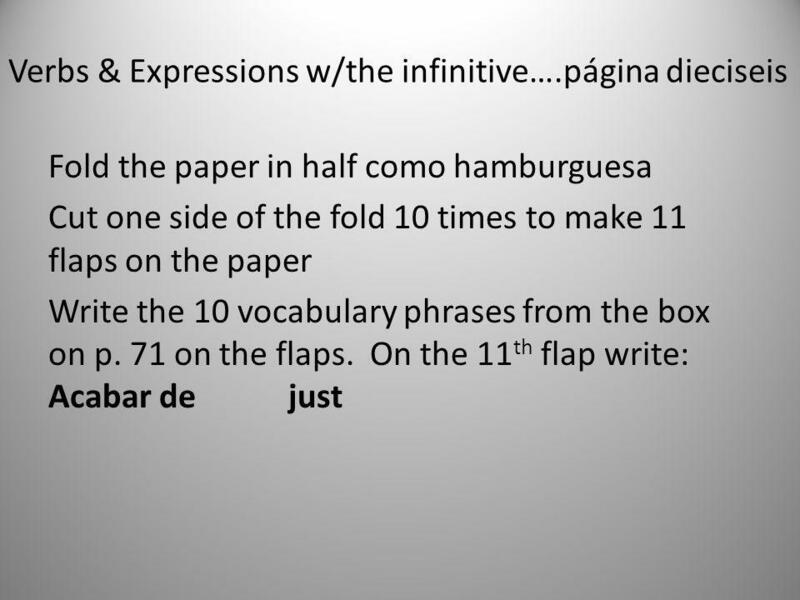 When you conjugate regular verbs in the present tense, take off the infinitive ending first. 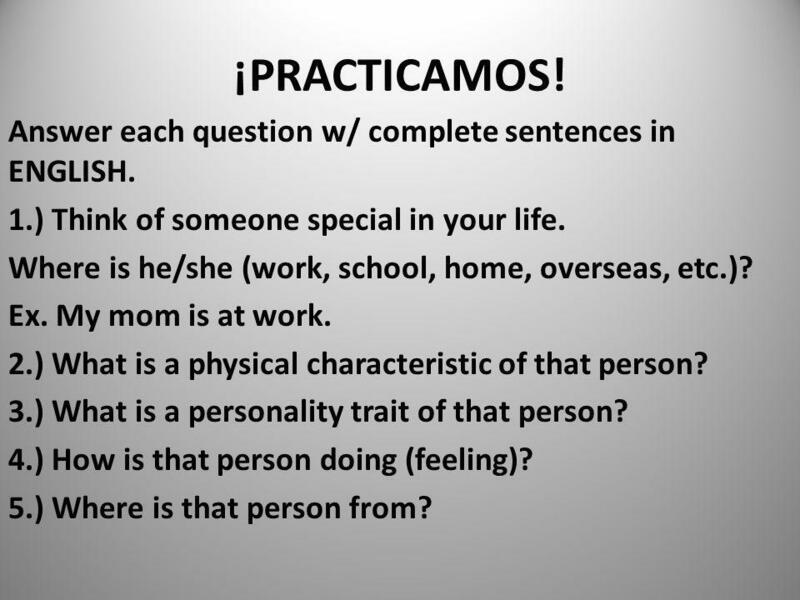 Describir (Daniel) Leer (Brandon y Eric) Trabajar (tú) Practicar (Ana y yo) 6. Dibujar (nosotros) 7. Correr (las chicas) 8. Caminar (tú y tus amigos) Tocar (yo) 10. Copiar (ella) After I have checked your practice and you have received a sticker meaning all answers are correct; go to the laptop cart and pick up the computer assigned to you. The list is on top of the cart. 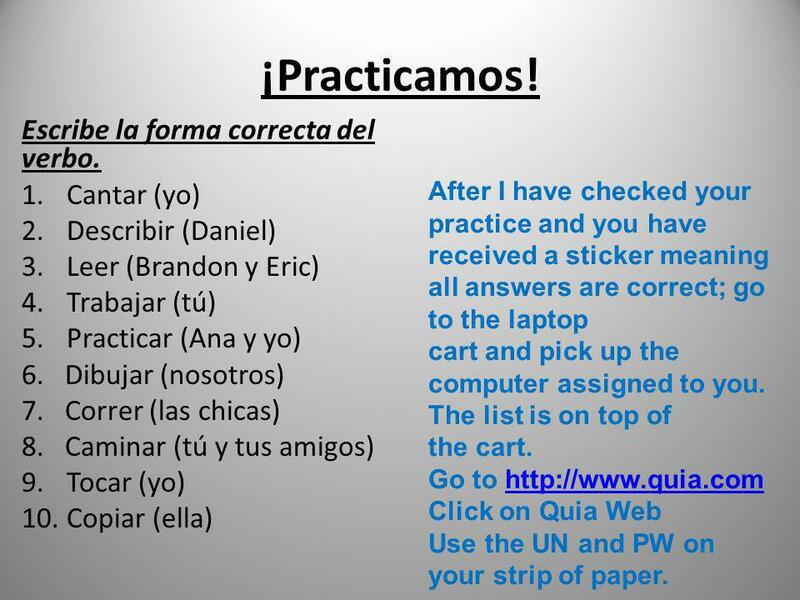 Go to Click on Quia Web Use the UN and PW on your strip of paper. *All question words have accents* Who? ¿Quién? What? ¿Qué? When? ¿Cuándo? Why? ¿Por qué? 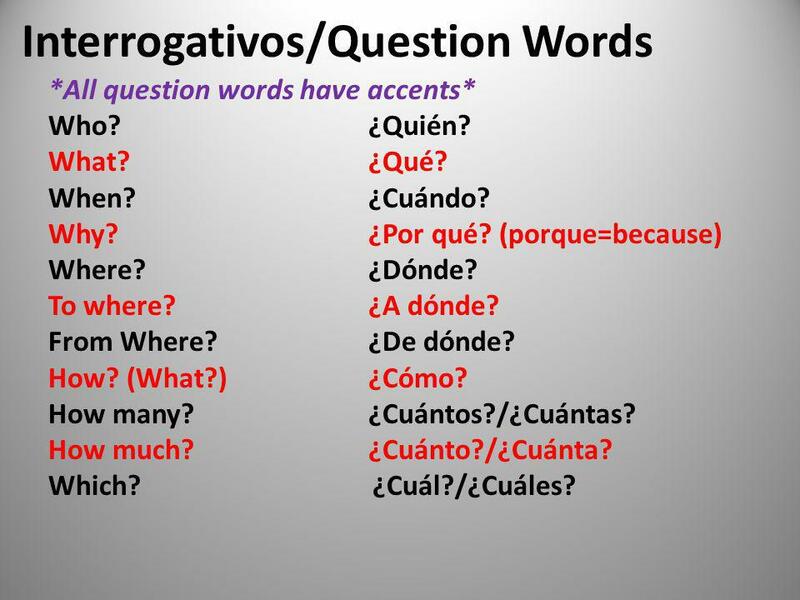 (porque=because) Where? ¿Dónde? To where? ¿A dónde? From Where? ¿De dónde? How? (What?) ¿Cómo? How many? ¿Cuántos?/¿Cuántas? How much? ¿Cuánto?/¿Cuánta? Which? ¿Cuál?/¿Cuáles? 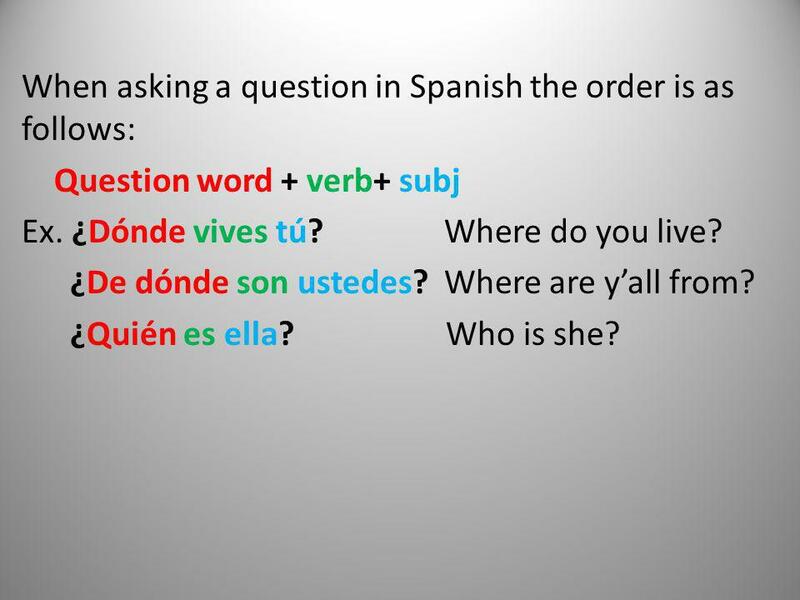 16 When asking a question in Spanish the order is as follows: Question word + verb+ subj Ex. 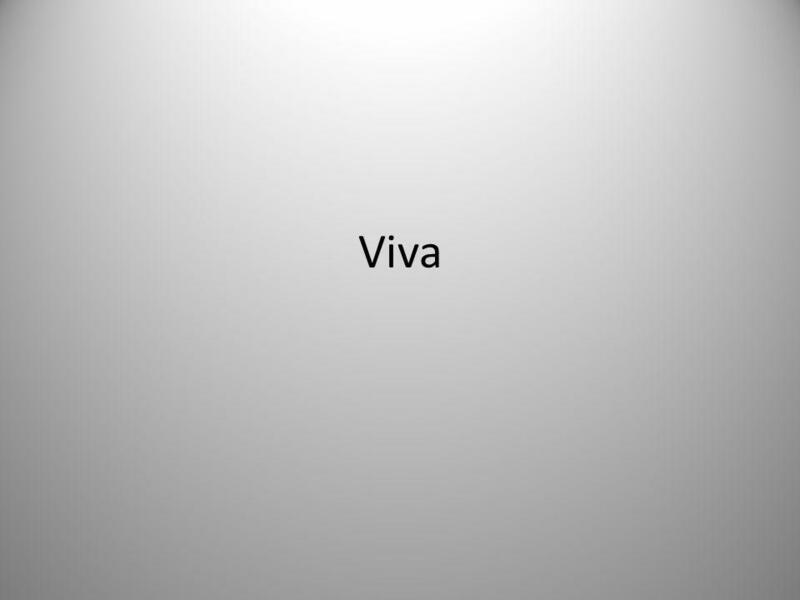 ¿Dónde vives tú? Where do you live? ¿De dónde son ustedes? Where are y’all from? ¿Quién es ella? Who is she? 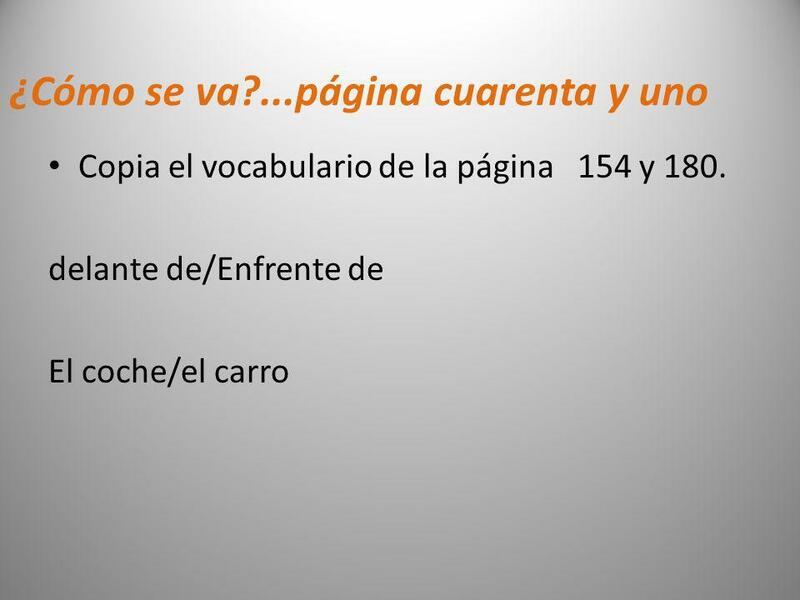 Copia el vocabulario de la página catorce en el libro. 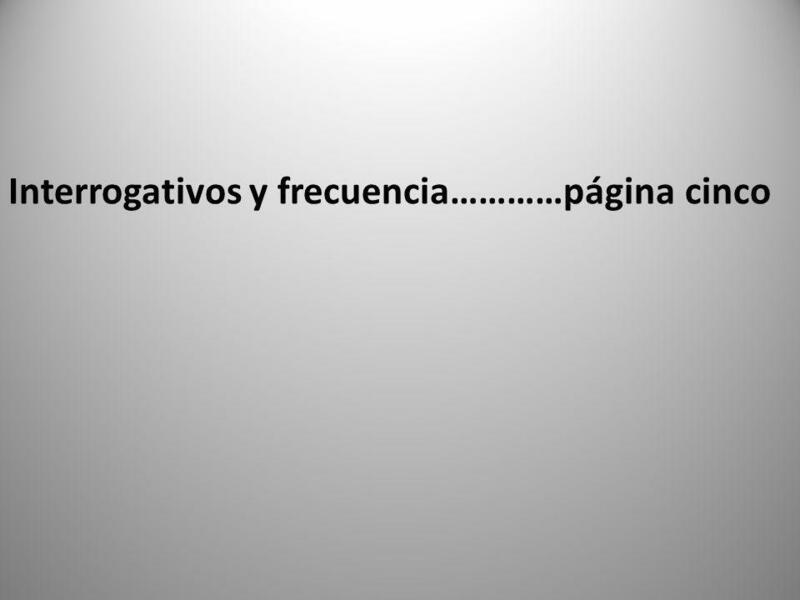 Escribe todas palabras. Escribe el español. 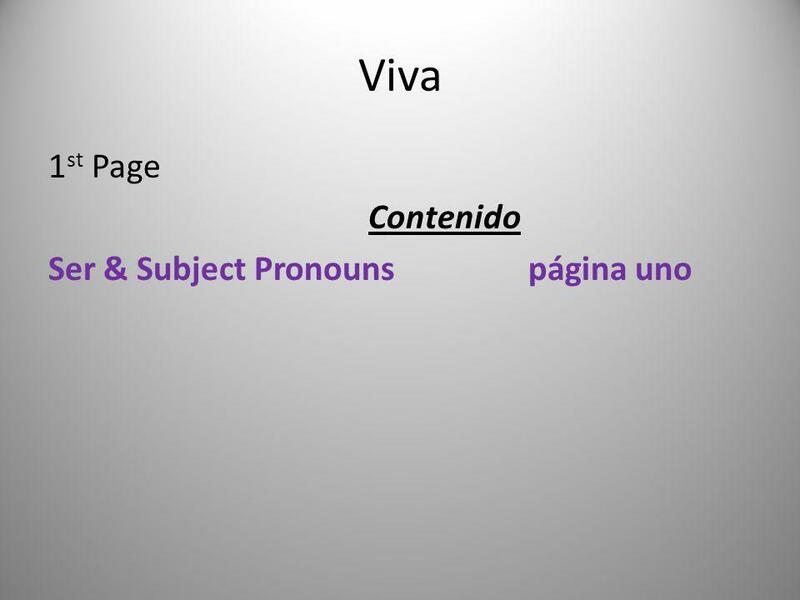 Sra Mayo voy a dar el inglés. Ex. 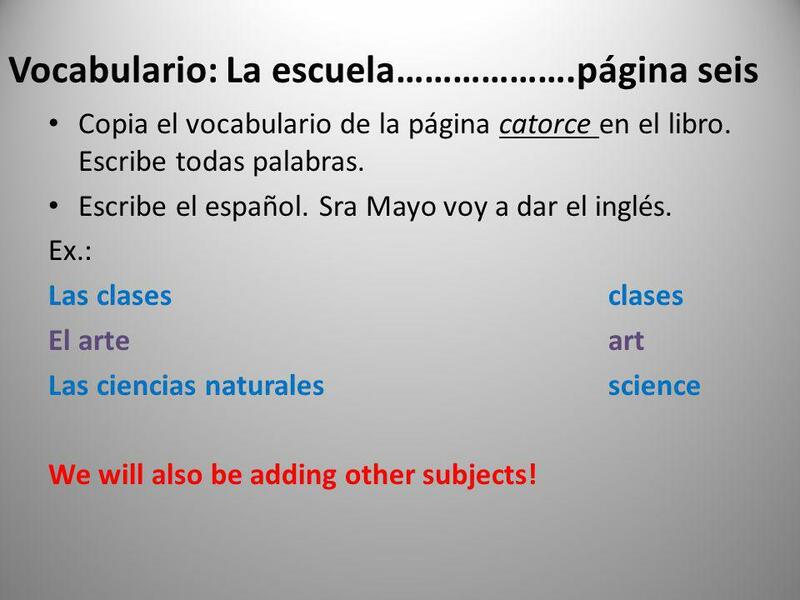 : Las clases	clases El arte	art Las ciencias naturales	science We will also be adding other subjects! 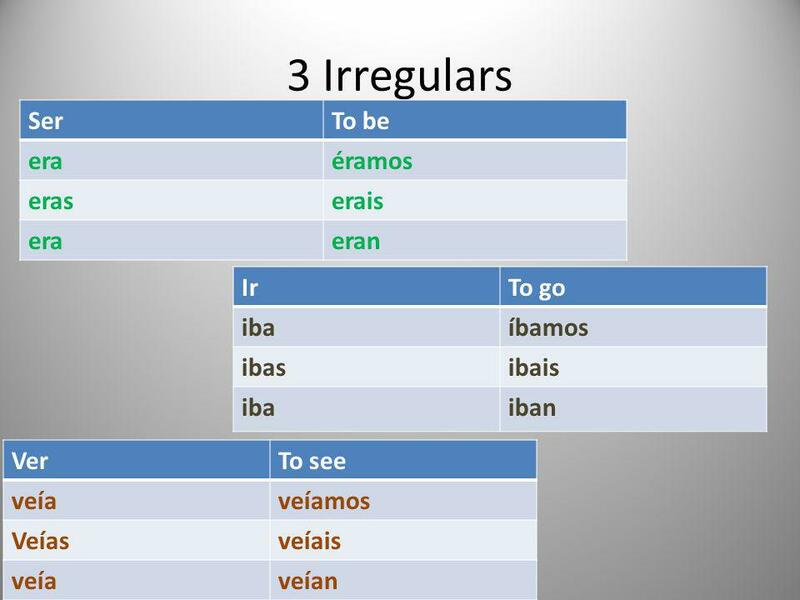 21 Irregular verbs have a conjugation pattern that is different from the usual pattern. 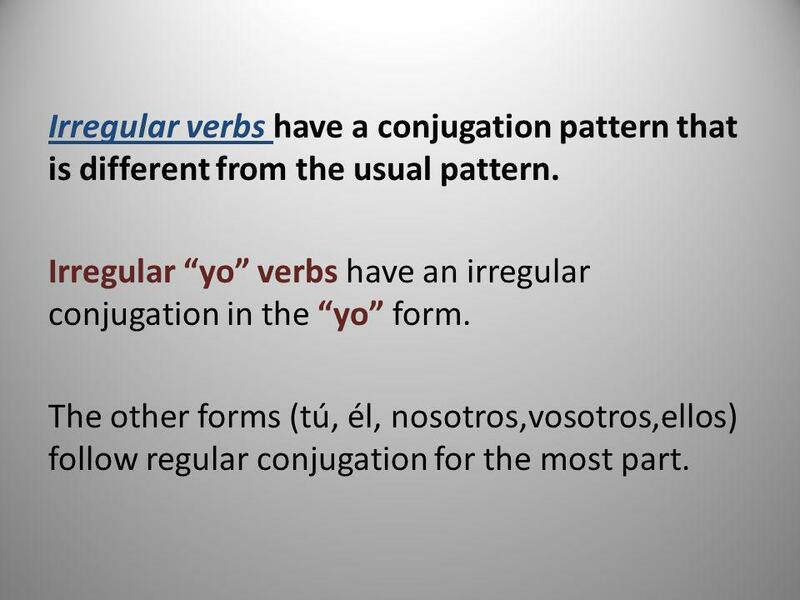 Irregular “yo” verbs have an irregular conjugation in the “yo” form. 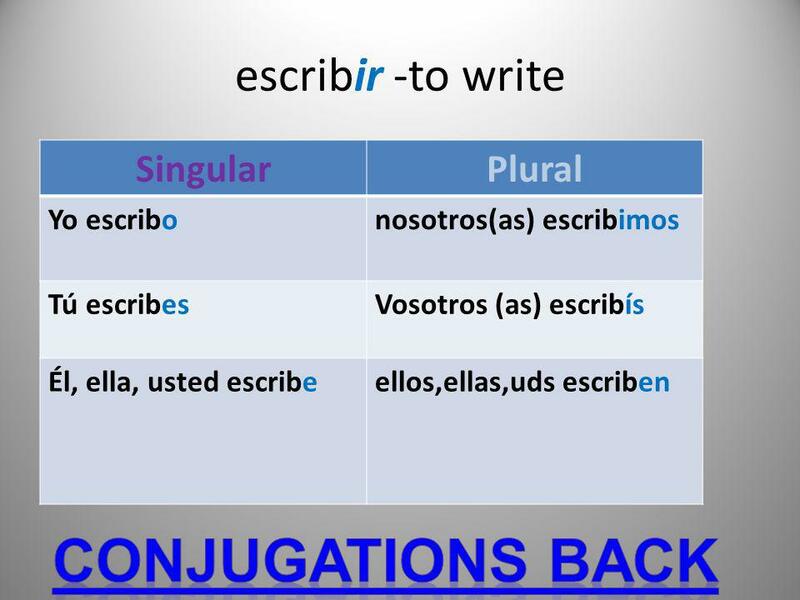 The other forms (tú, él, nosotros,vosotros,ellos) follow regular conjugation for the most part. 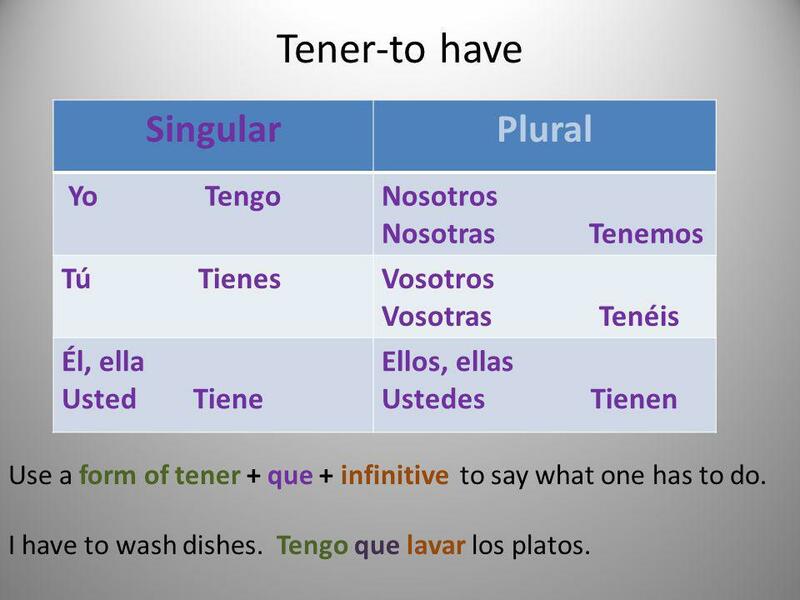 Tú Tienes Vosotros Vosotras Tenéis Él, ella Usted Tiene Ellos, ellas Ustedes Tienen Use a form of tener + que + infinitive to say what one has to do. I have to wash dishes. Tengo que lavar los platos. 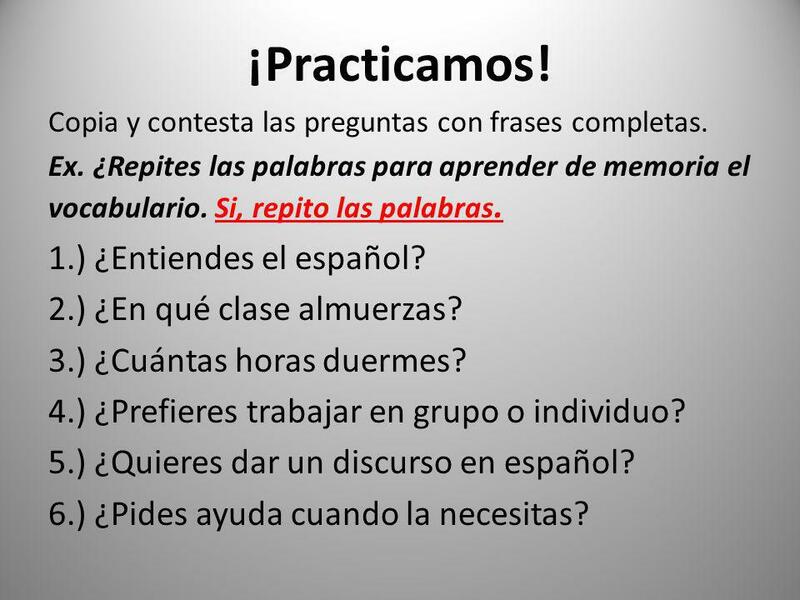 iPracticamos! 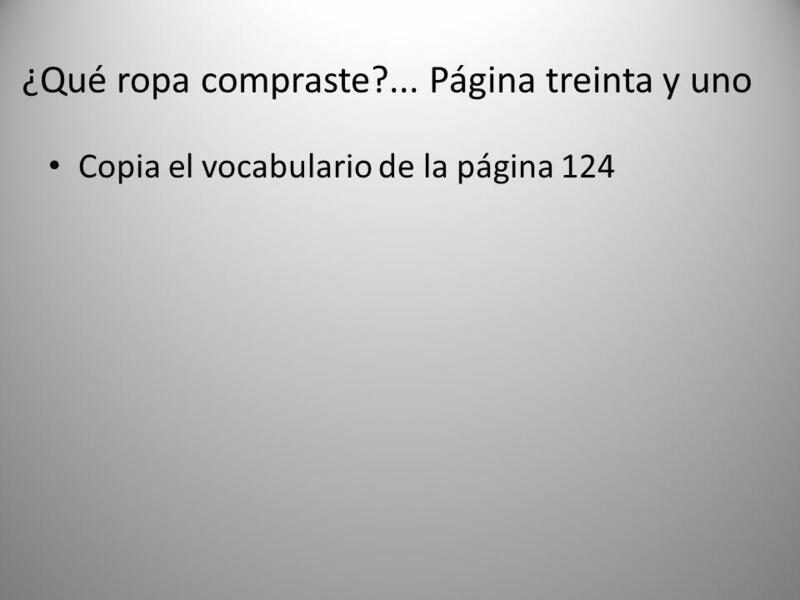 Contesta con frases completas. 1.) ¿Qué tienes que hacer en casa? 2.) ¿Qué traes a la escuela? 3.) ¿Pones la mesa cuando comes con la familia? 4.) 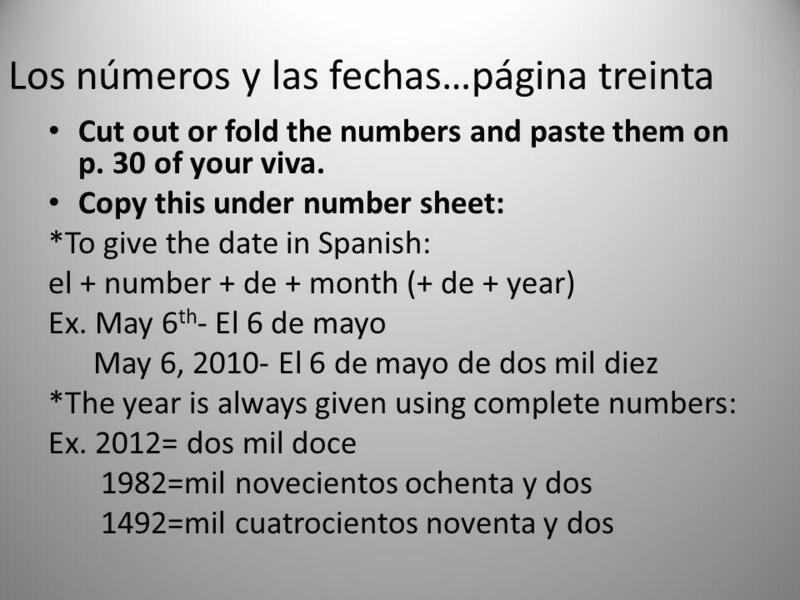 ¿Dónde haces la tarea? 5.) ¿Tienes una computadora en casa? 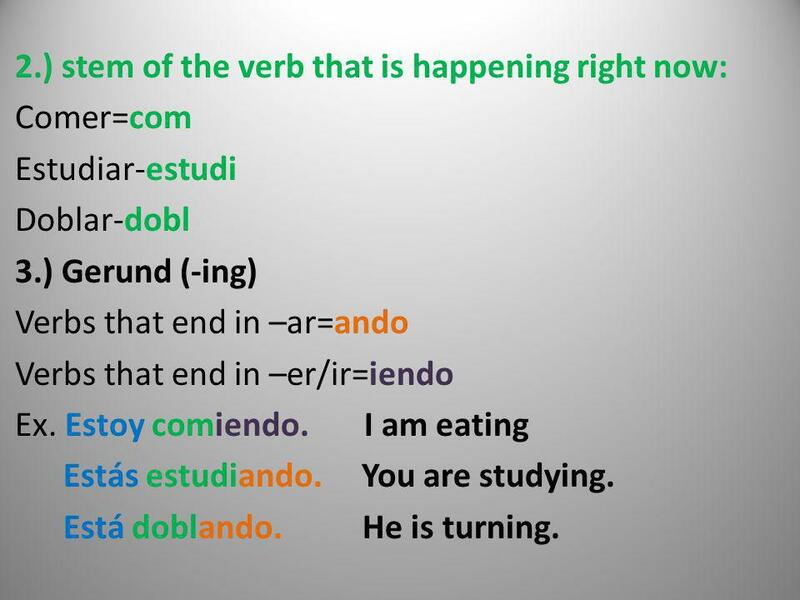 The stem of a verb is what is left after you take off the infinitive ending. 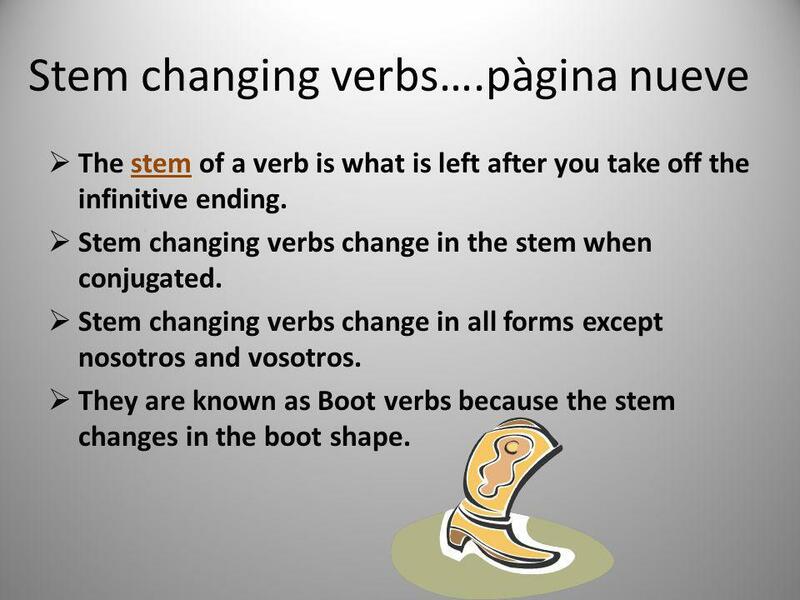 Stem changing verbs change in the stem when conjugated. 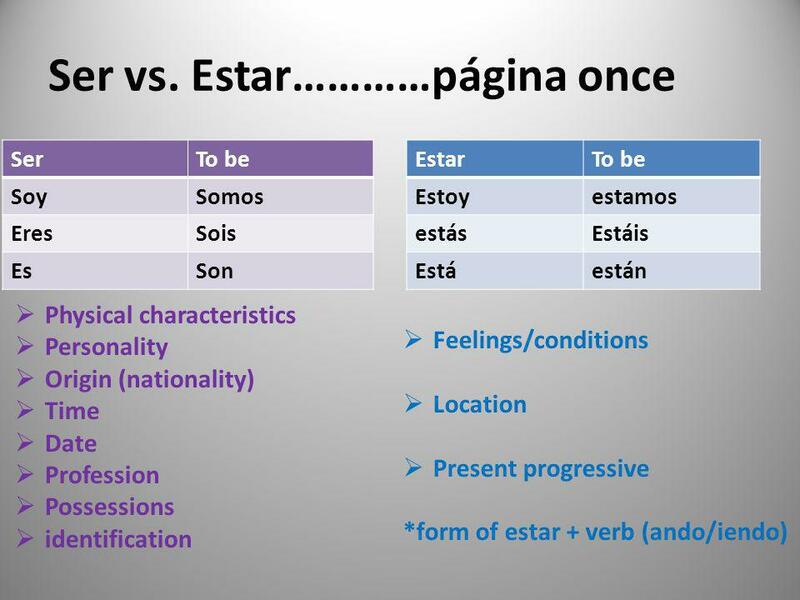 Stem changing verbs change in all forms except nosotros and vosotros. 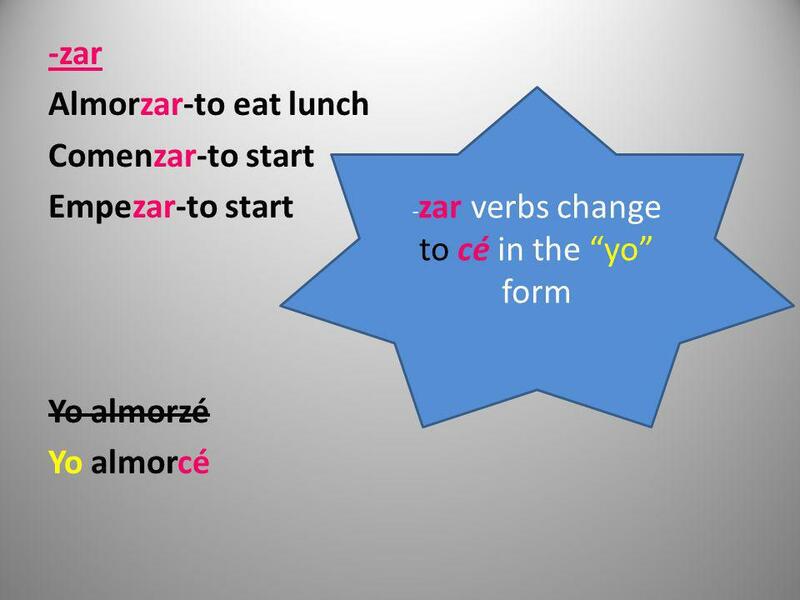 They are known as Boot verbs because the stem changes in the boot shape. 28 Jugar changes from u>ue. 2.) 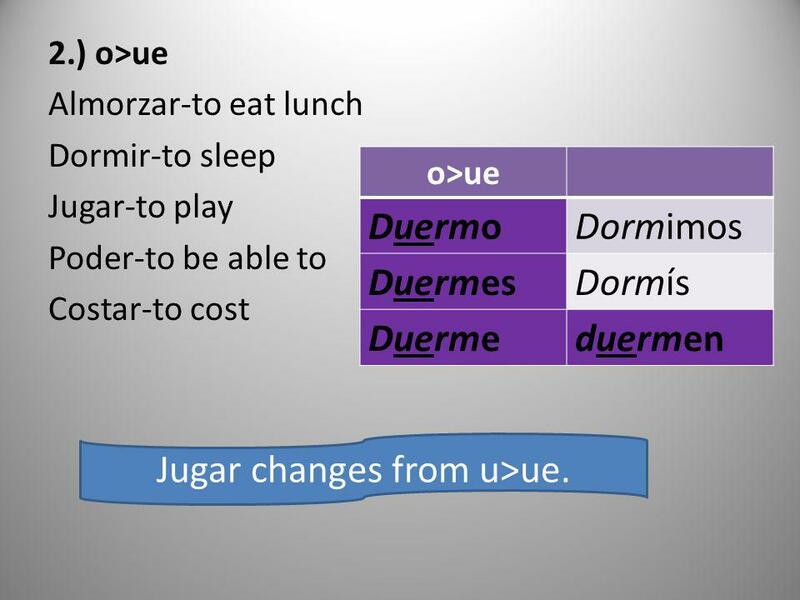 o>ue Almorzar-to eat lunch Dormir-to sleep Jugar-to play Poder-to be able to Costar-to cost o>ue Duermo Dormimos Duermes Dormís Duerme duermen Jugar changes from u>ue. 30 ¡Practicamos! 1.) ¿Entiendes el español? 2.) ¿En qué clase almuerzas? Copia y contesta las preguntas con frases completas. Ex. 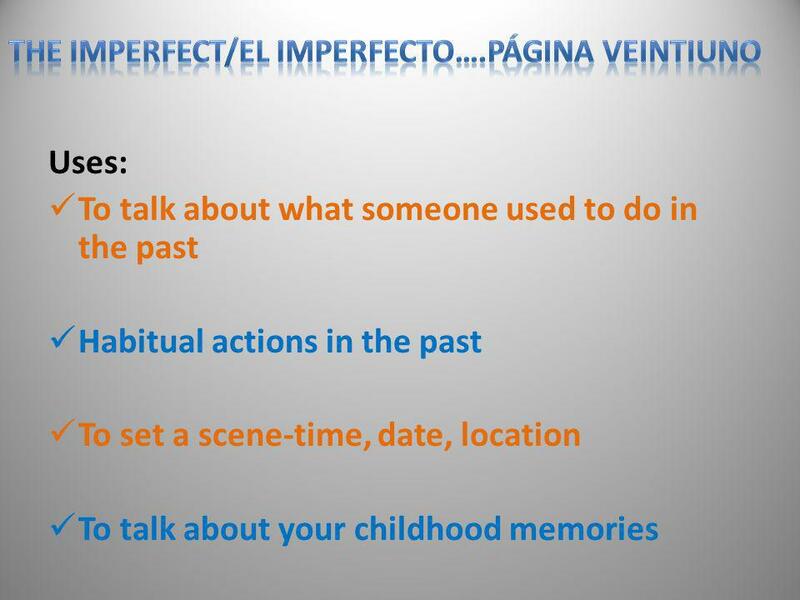 ¿Repites las palabras para aprender de memoria el vocabulario. Si, repito las palabras. 1.) ¿Entiendes el español? 2.) ¿En qué clase almuerzas? 3.) 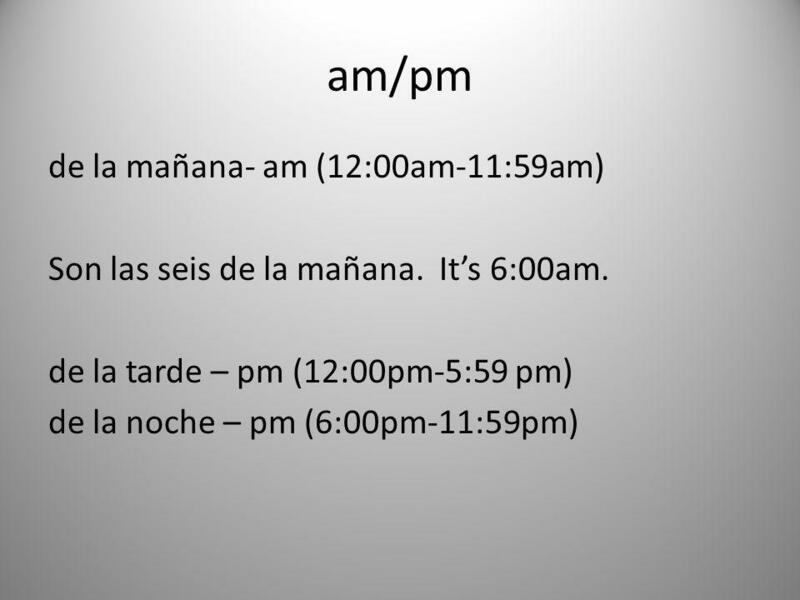 ¿Cuántas horas duermes? 4.) ¿Prefieres trabajar en grupo o individuo? 5.) ¿Quieres dar un discurso en español? 6.) ¿Pides ayuda cuando la necesitas? 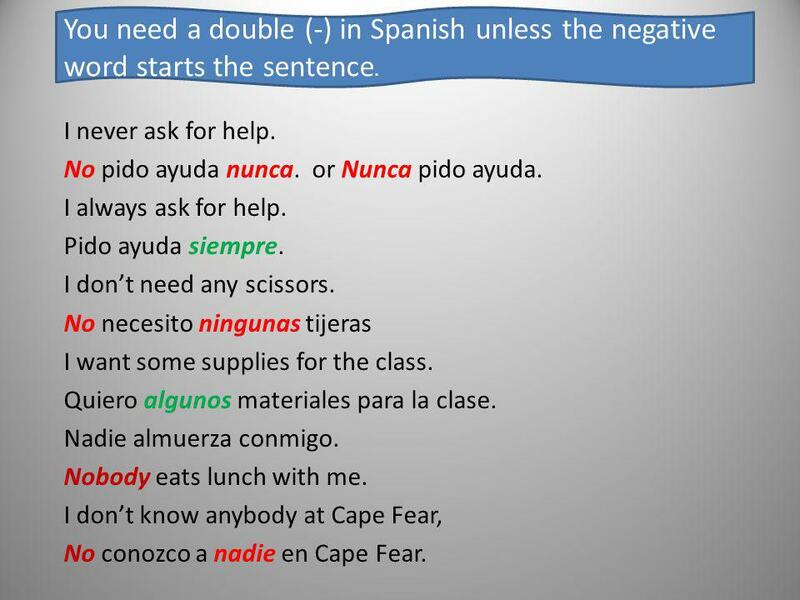 32 You need a double (-) in Spanish unless the negative word starts the sentence. I never ask for help. No pido ayuda nunca. or Nunca pido ayuda. I always ask for help. Pido ayuda siempre. I don’t need any scissors. 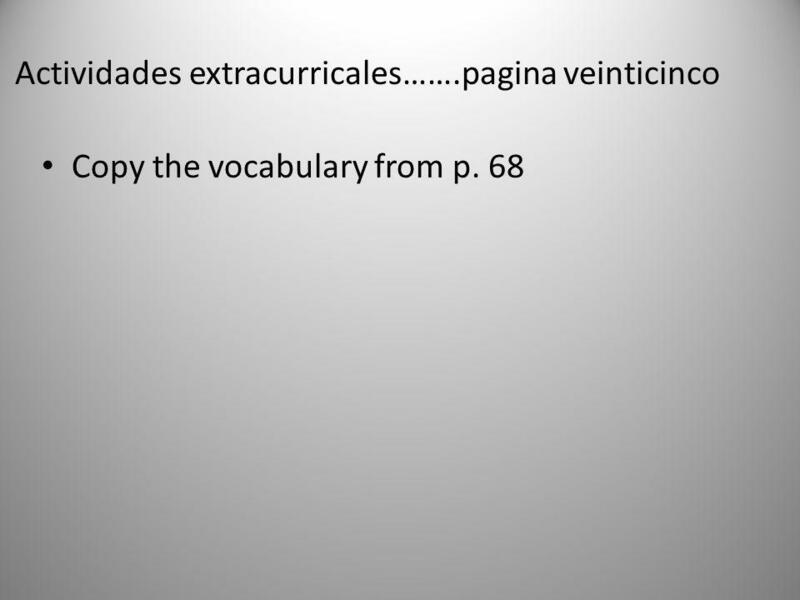 No necesito ningunas tijeras I want some supplies for the class. 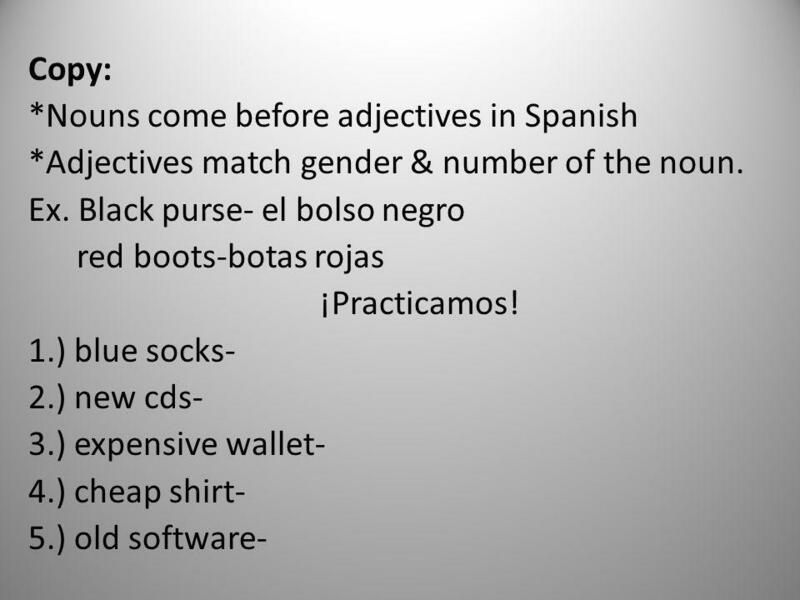 Quiero algunos materiales para la clase. Nadie almuerza conmigo. Nobody eats lunch with me. I don’t know anybody at Cape Fear, No conozco a nadie en Cape Fear. 33 ¡Practicamos! 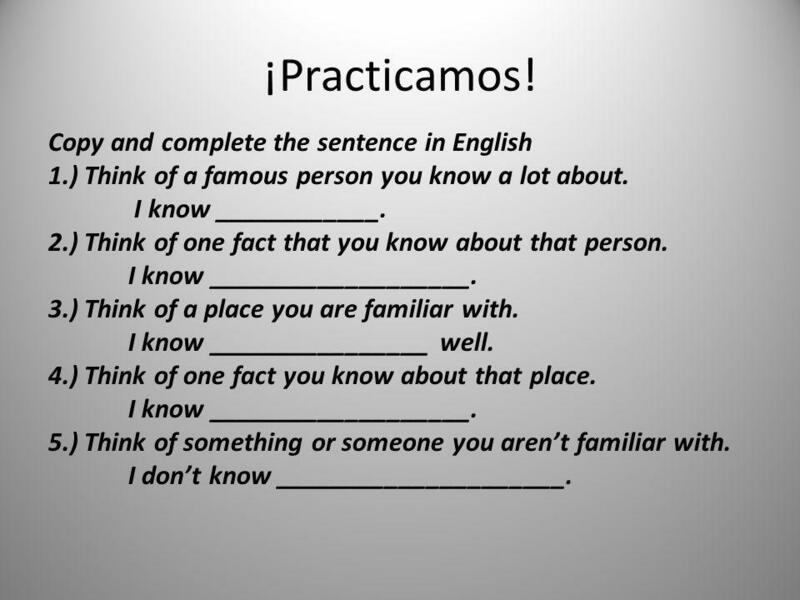 Copy and complete the sentences using your vocabulary words (you choose). 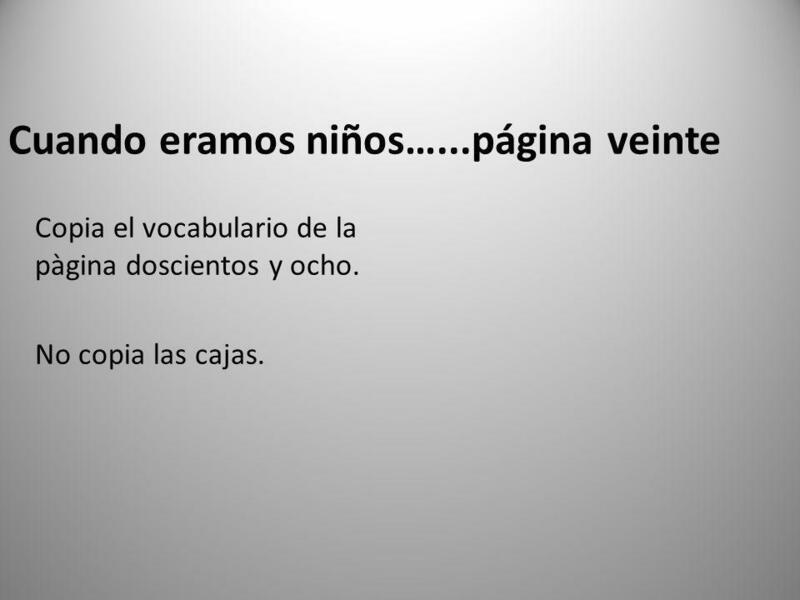 Translate the sentence to Spanish. 1.) I have some __________________. (scissors, tape, books, etc) 2.) I always ________________. (arrive on time, arrive late, turn in work, etc.) 3.) I don’t never __________________. (arrive on time, arrive late, turn in work, etc.) 4.) I don’t need no _________________. (pencils, pens, paper, etc.). 35 Por ejemplo…. ¿Cómo estás? Julio es alto. Estoy entusiasmado. ¿Dónde está ella? Ella está en la boda. ¿Qué están haciendo Uds.? 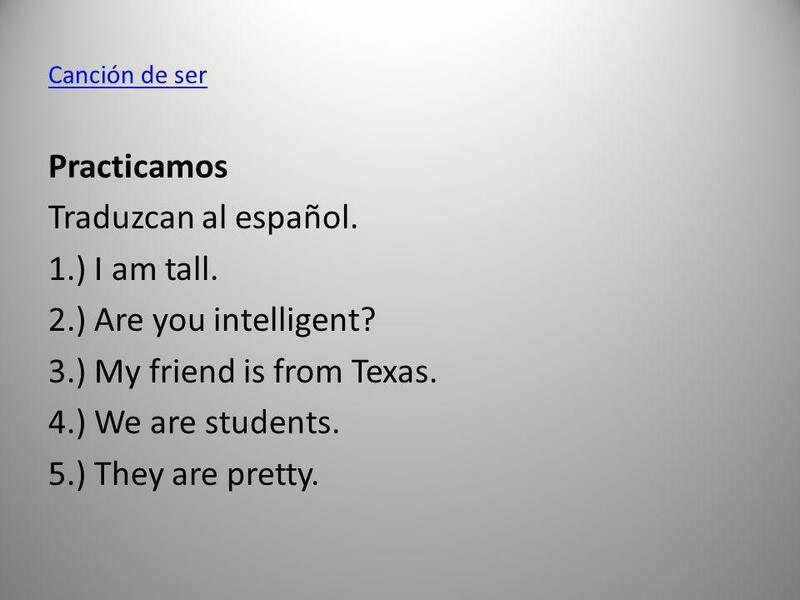 Estamos estudiando. Julio es alto. Nosotros somos graciosos. 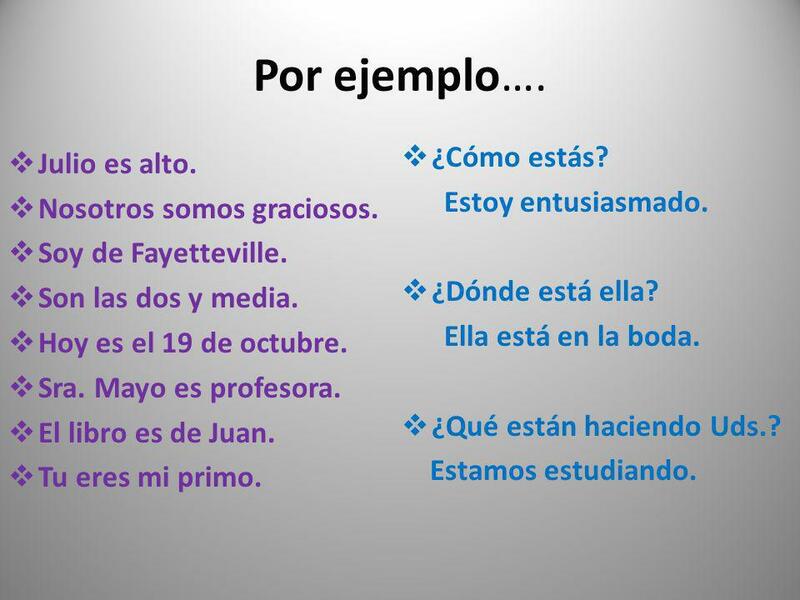 Soy de Fayetteville. Son las dos y media. Hoy es el 19 de octubre. Sra. Mayo es profesora. El libro es de Juan. Tu eres mi primo. 36 ¡PRACTICAMOS! 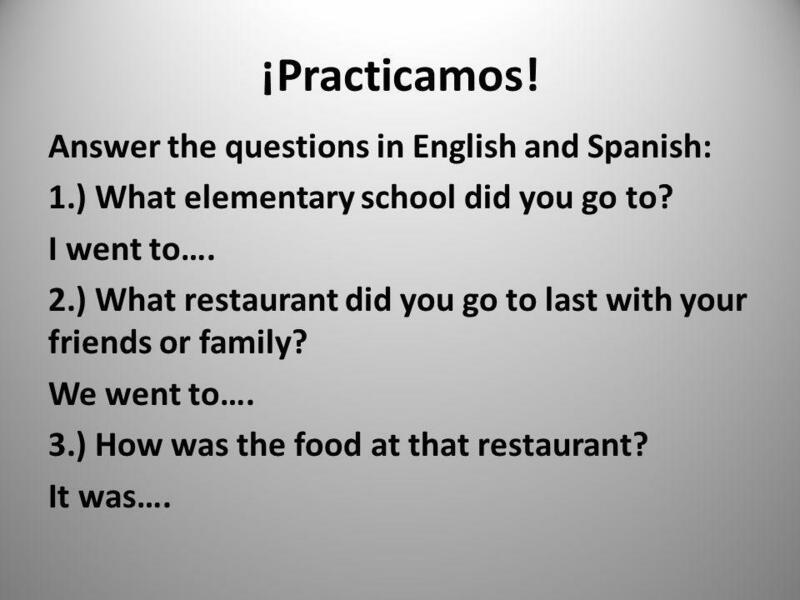 Answer each question w/ complete sentences in ENGLISH. 1.) Think of someone special in your life. Where is he/she (work, school, home, overseas, etc.)? Ex. My mom is at work. 2.) What is a physical characteristic of that person? 3.) What is a personality trait of that person? 4.) How is that person doing (feeling)? 5.) Where is that person from? 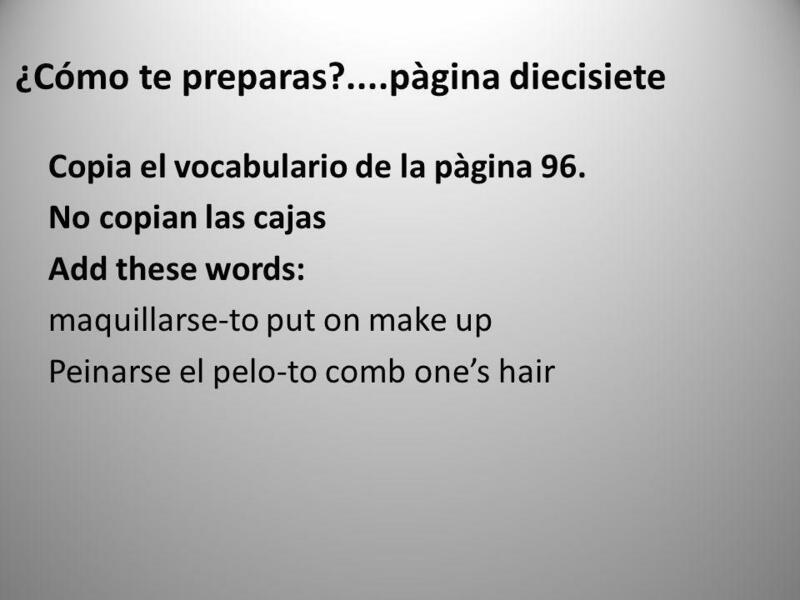 37 Traduzca las frases al español. 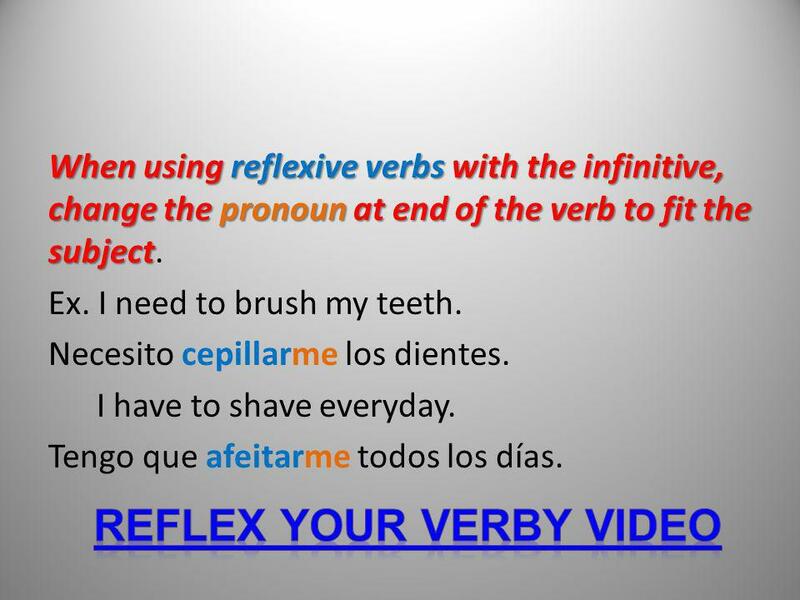 Reflexive Verbs are verbs that you do to yourself. 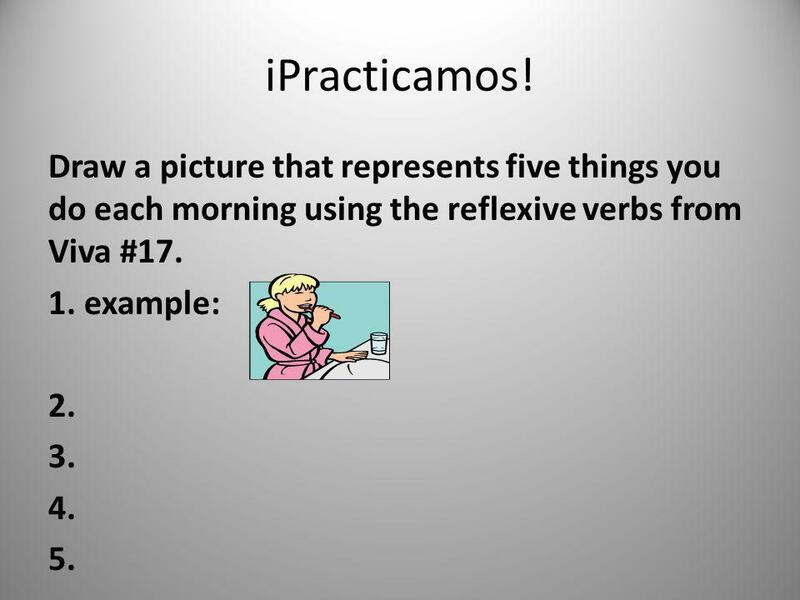 (Reflection) You know a verb is reflexive if it ends in –se. 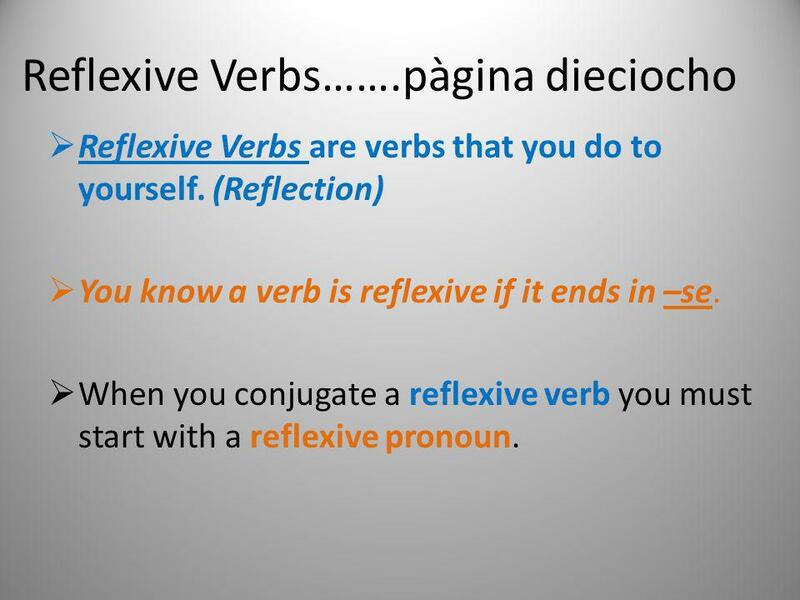 When you conjugate a reflexive verb you must start with a reflexive pronoun. Se afeita Se afeitan Do you shave your legs? ¿Te afeitas las piernas? 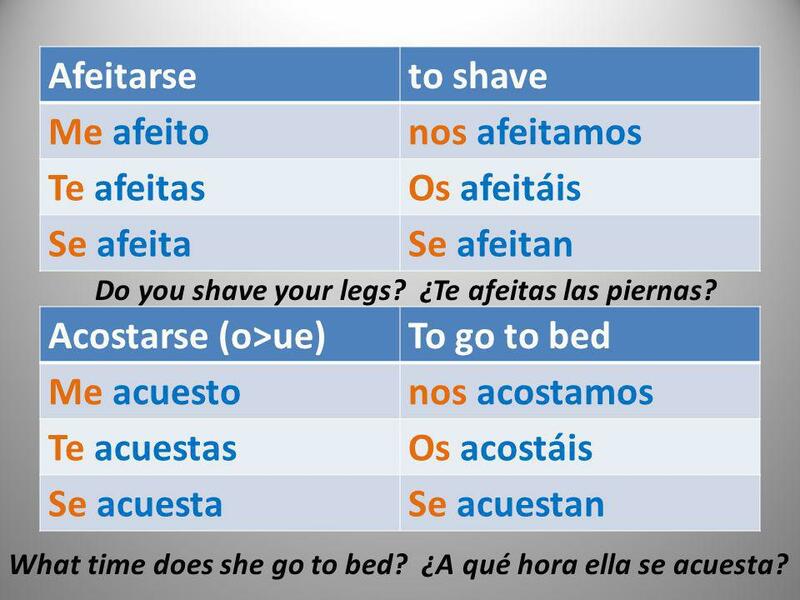 Acostarse (o>ue) To go to bed Me acuesto nos acostamos Te acuestas Os acostáis Se acuesta Se acuestan What time does she go to bed? ¿A qué hora ella se acuesta? 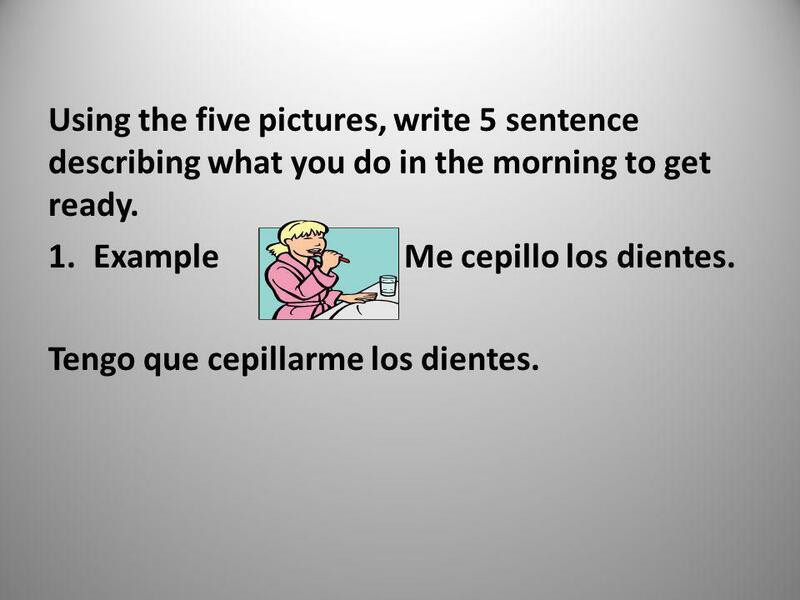 46 Using the five pictures, write 5 sentence describing what you do in the morning to get ready. Example Me cepillo los dientes. Tengo que cepillarme los dientes. 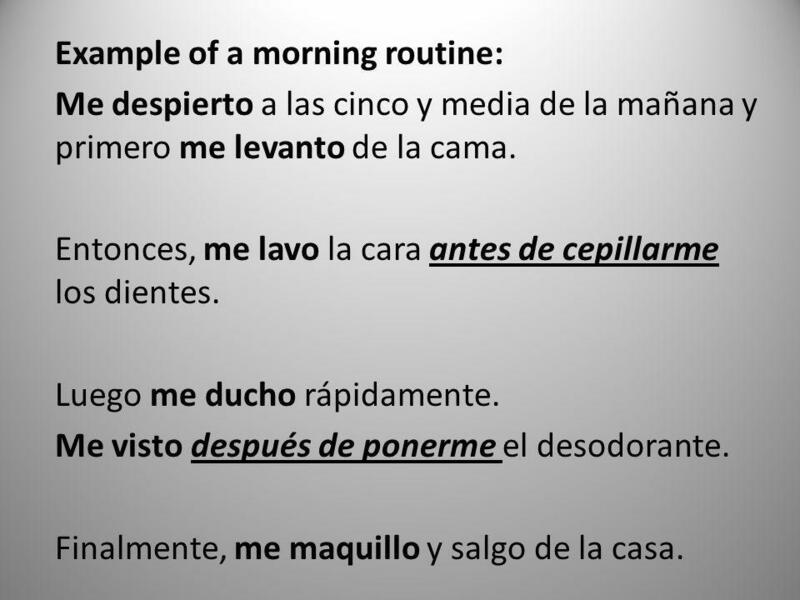 48 Example of a morning routine: Me despierto a las cinco y media de la mañana y primero me levanto de la cama. Entonces, me lavo la cara antes de cepillarme los dientes. Luego me ducho rápidamente. Me visto después de ponerme el desodorante. Finalmente, me maquillo y salgo de la casa. 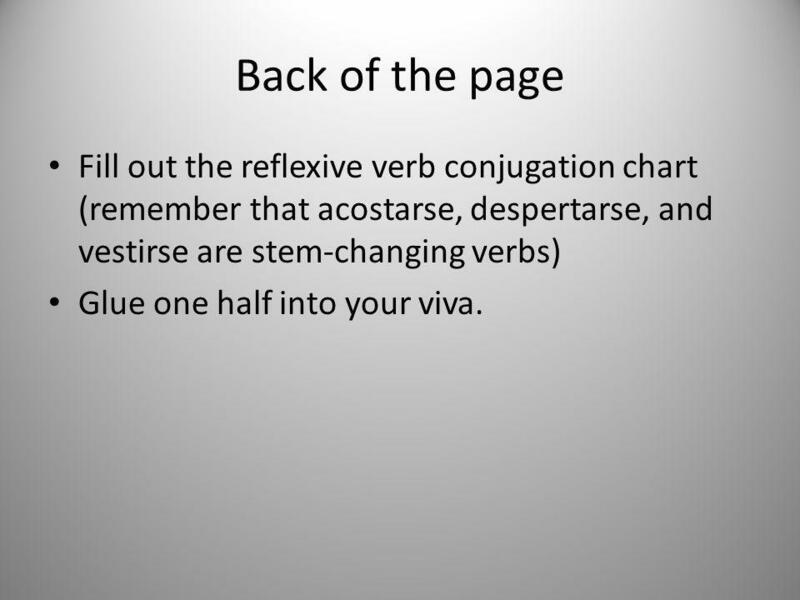 49 Back of the page Fill out the reflexive verb conjugation chart (remember that acostarse, despertarse, and vestirse are stem-changing verbs) Glue one half into your viva. 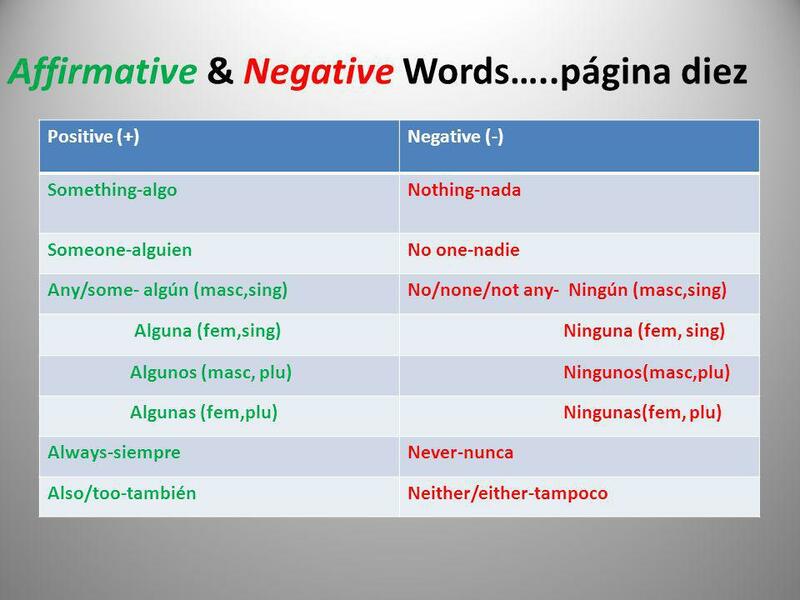 Copia el vocabulario de la pàgina doscientos y ocho. No copia las cajas. 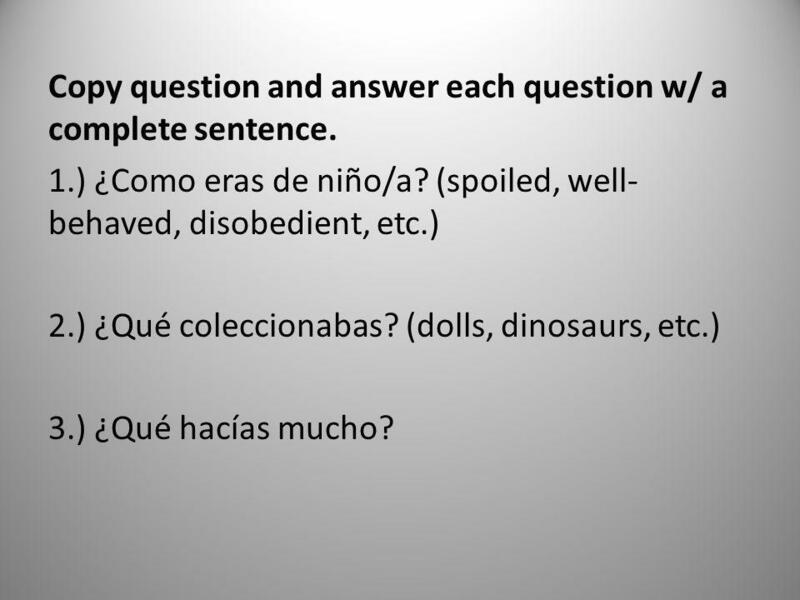 Copy question and answer each question w/ a complete sentence. 1.) ¿Como eras de niño/a? (spoiled, well-behaved, disobedient, etc.) 2.) ¿Qué coleccionabas? (dolls, dinosaurs, etc.) 3.) ¿Qué hacías mucho? 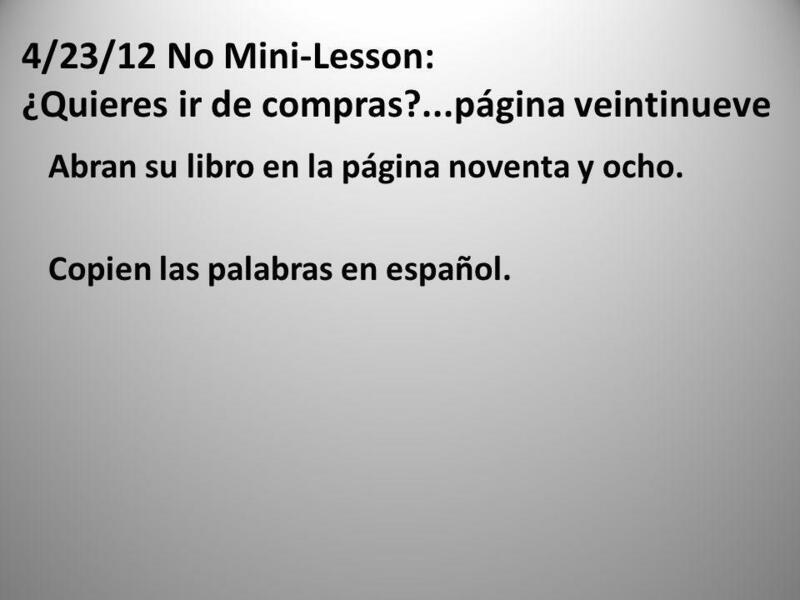 55 Post lesson Translate the sentences from the pre-lesson activity. Classwork on a separate sheet of paper: 1.) 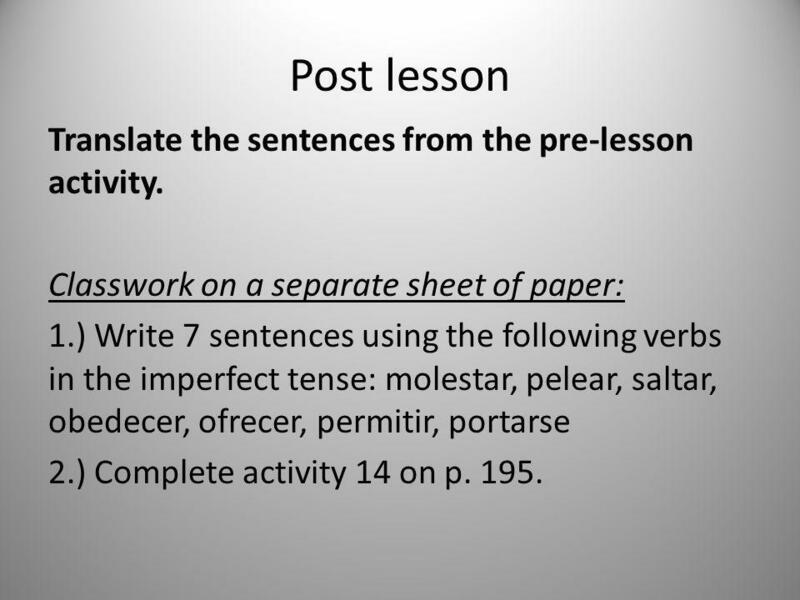 Write 7 sentences using the following verbs in the imperfect tense: molestar, pelear, saltar, obedecer, ofrecer, permitir, portarse 2.) Complete activity 14 on p. 195. An indirect object answers the question to whom or for whom. 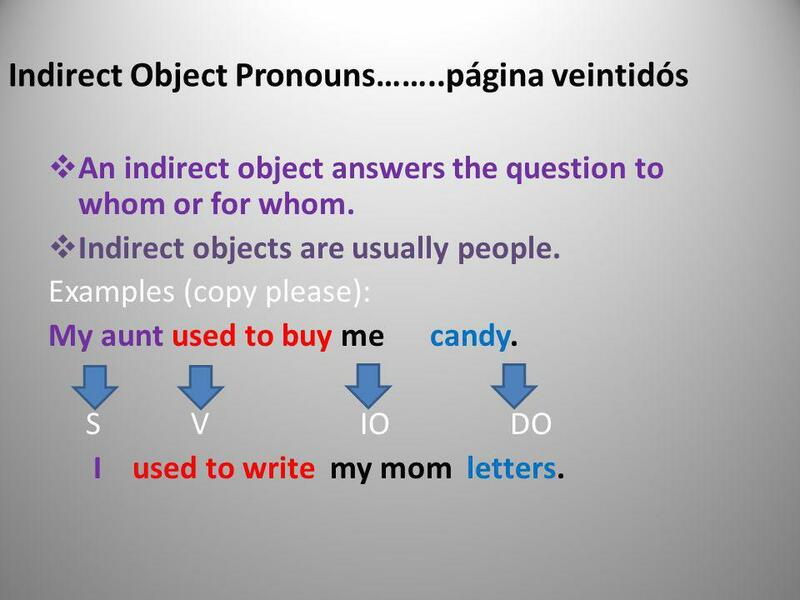 Indirect objects are usually people. Examples (copy please): My aunt used to buy me candy. S V IO DO I used to write my mom letters. 57 Mi tía me compraba dulces. Mi tía me compraba dulces (a mí). S IOP V DO Yo le escribía cartas. Yo le escribía cartas (a mi madre). 58 ¡Practicamos! A.) Complete Activity 22 from p. 199 in the textbook. Ex. mi padre Ella le compraba una corbata a mi padre. (for him=le) S IOP V DO IO Identify the subject, verb, direct object, indirect object and indirect object pronoun in each sentence. 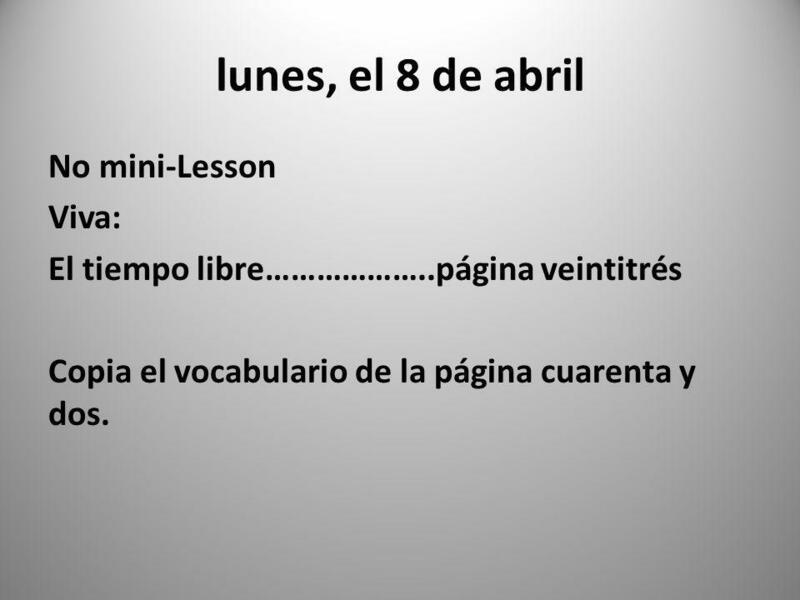 59 lunes, el 8 de abril No mini-Lesson Viva: El tiempo libre………………..página veintitrés Copia el vocabulario de la página cuarenta y dos. To go Yo voy Nosotros (as) vamos Tú vas Vosotros (as) váis Él, ella Usted va Ellos(as) Ustedes van Ex. I go shopping on Saturdays. Yo voy de compras los sabados Ex. He goes to work every night. Él va al trabajo cada noche. a + el = al Voy a + el parque becomes voy al parque. I am going to the park. 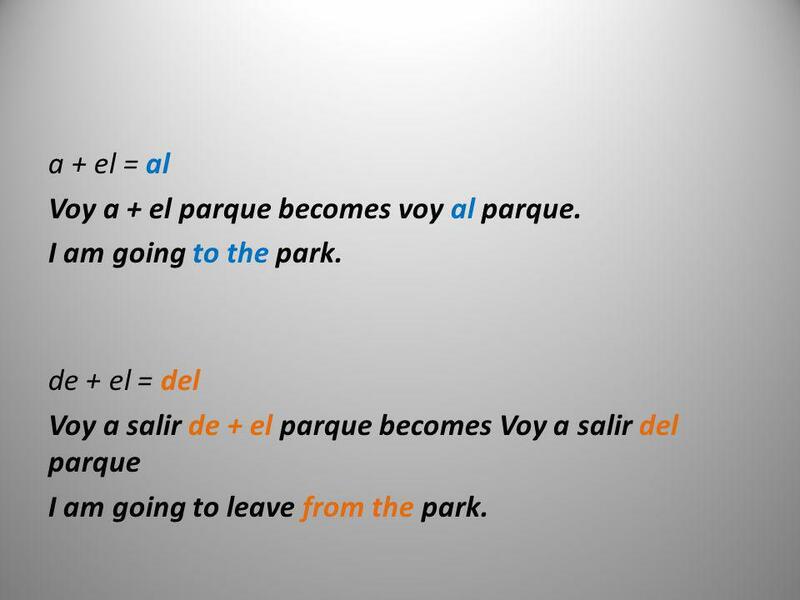 de + el = del Voy a salir de + el parque becomes Voy a salir del parque I am going to leave from the park. 63 ¡Practicamos! 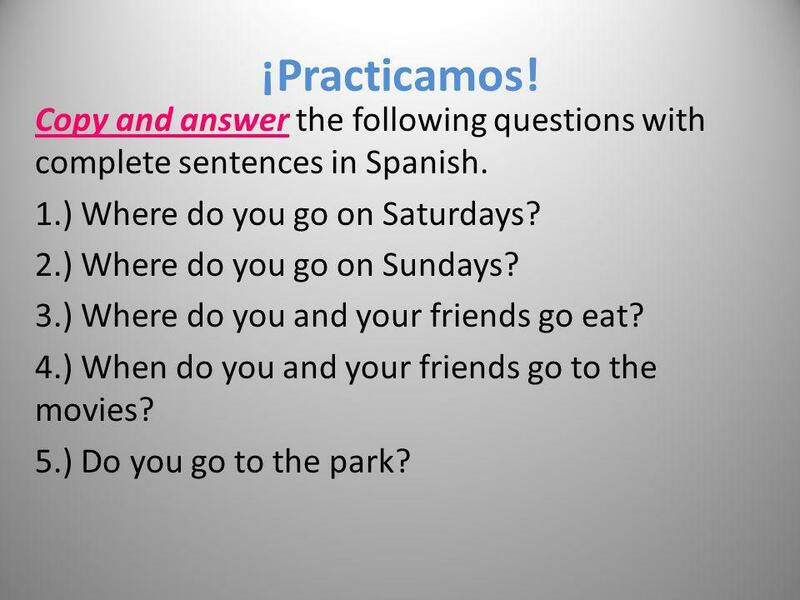 Copy and answer the following questions with complete sentences in Spanish. 1.) Where do you go on Saturdays? 2.) Where do you go on Sundays? 3.) Where do you and your friends go eat? 4.) When do you and your friends go to the movies? 5.) Do you go to the park? 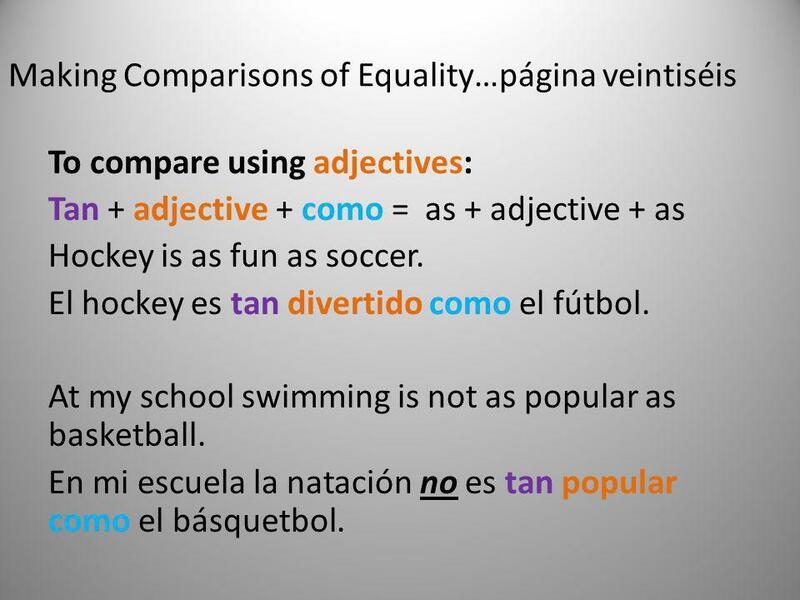 To compare using adjectives: Tan + adjective + como = as + adjective + as Hockey is as fun as soccer. El hockey es tan divertido como el fútbol. At my school swimming is not as popular as basketball. En mi escuela la natación no es tan popular como el básquetbol. 66 To compare nouns: Tanto(a) + noun + como = as much + noun + as Tantos (as) + noun + como=as many + noun+ as I have as many sisters as you. Tengo tantas hermanas como tú. Does LeBron earn as much money as Kobe? 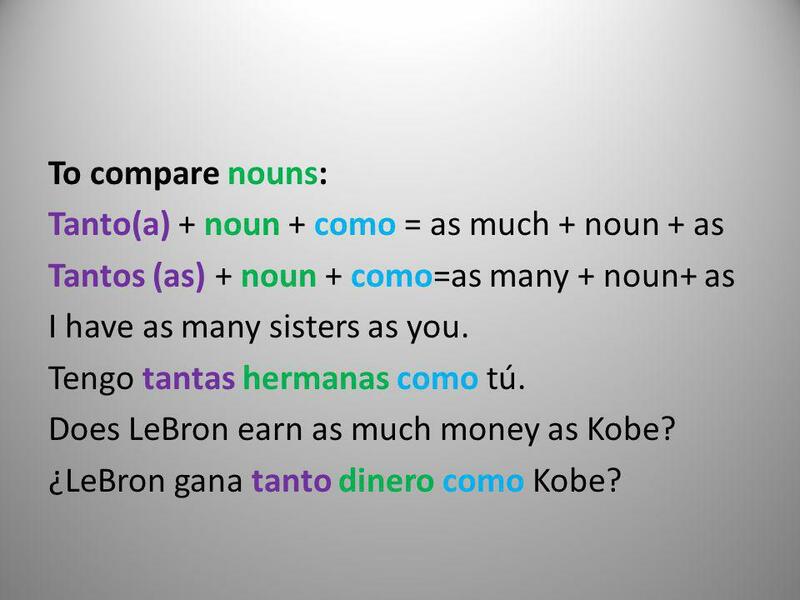 ¿LeBron gana tanto dinero como Kobe? 67 ¡Practicamos! 1.) Think of a person that is around the same height as you. Copy and complete. _____________ is as tall/short as I. 2.) Think of a person that is the same age as you. Copy and complete the sentence. _____________ is as old/young as I. 3.) Think of someone that has as many friends, siblings or problems as you do. Copy and complete the sentence below. _____________ has as many problems/friends/siblings as I. 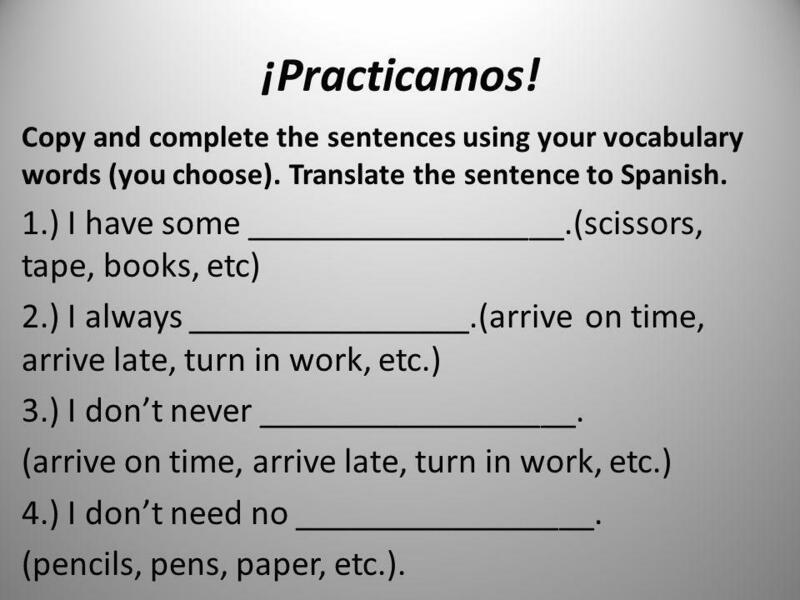 Translate the three sentences to Spanish. Ex. #1) Angela is as short as I am. Ángela es tan baja como yo. 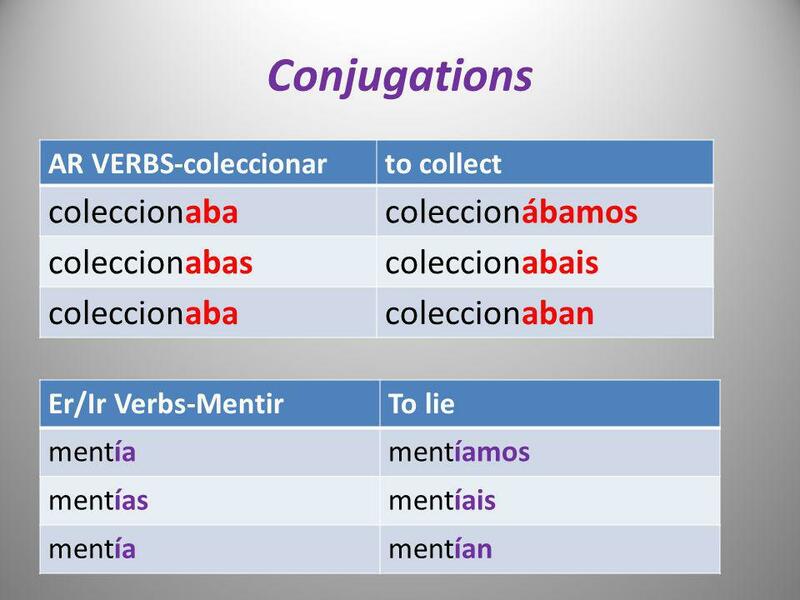 Both verbs mean to know SABER CONOCER Yo sé Nosotros (as) sabemos Tú sabes Vosotros (as) sabéis Él, ella Usted sabe Ellos, ellas Ustedes saben Yo conozco Nosotros (as) conocemos Tu conoces Vosotros (as) conocéis Él, ella Usted conoce Ellos, ellas Ustedes conocen Saber means to know facts & information Ex. I know the colors in Spanish. Sé los colores en español. 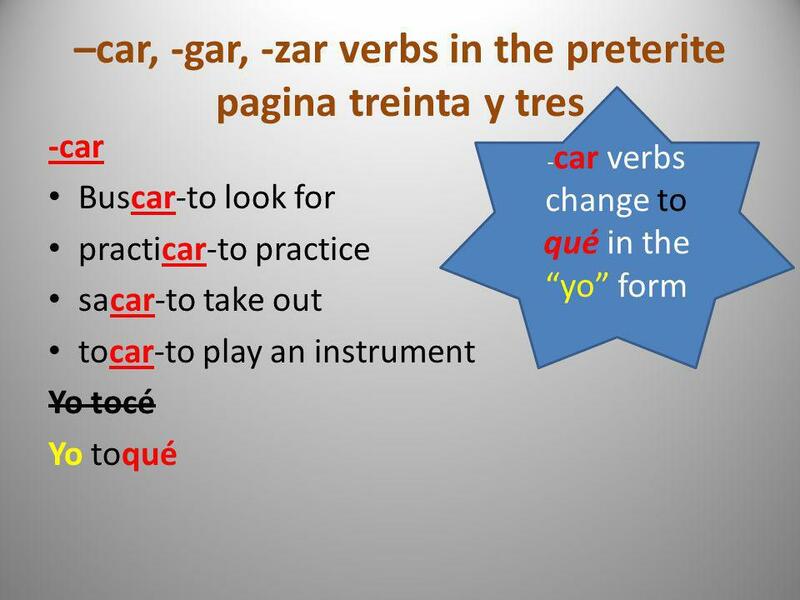 You can also use saber with the infinitive of another verb to say someone knows how to do something Ex. Do you know how to draw? ¿Sabes dibujar? 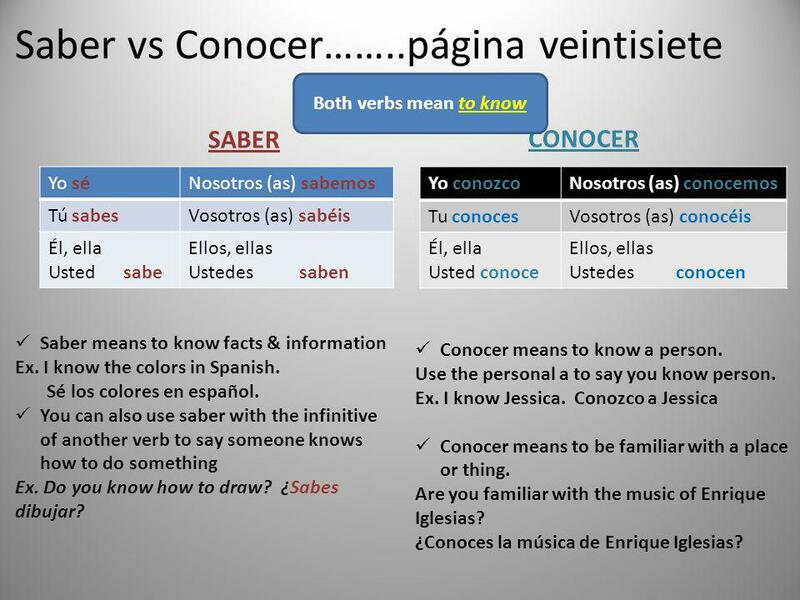 Conocer means to know a person. Use the personal a to say you know person. Ex. I know Jessica. Conozco a Jessica Conocer means to be familiar with a place or thing. Are you familiar with the music of Enrique Iglesias? ¿Conoces la música de Enrique Iglesias? 70 ¡Practicamos! 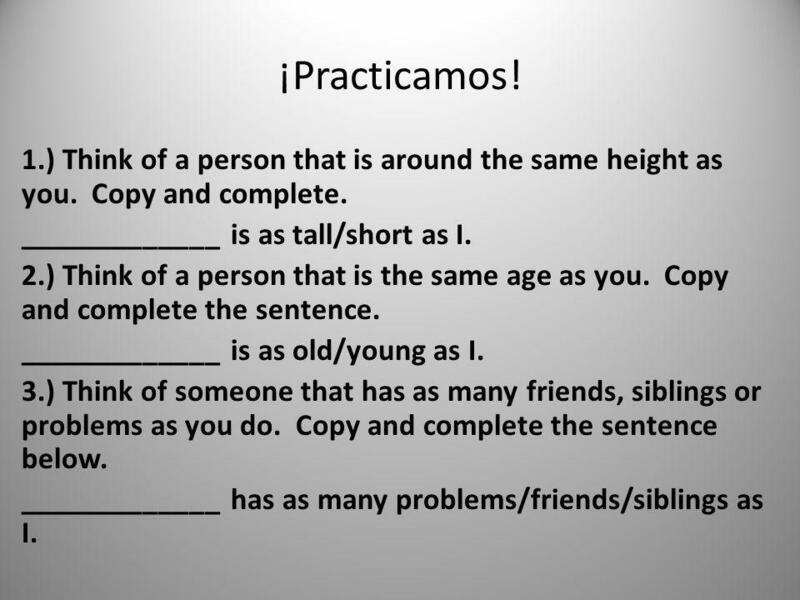 Copy and complete the sentence in English 1.) Think of a famous person you know a lot about. I know ____________. 2.) Think of one fact that you know about that person. I know ___________________. 3.) Think of a place you are familiar with. I know ________________ well. 4.) Think of one fact you know about that place. 5.) Think of something or someone you aren’t familiar with. I don’t know _____________________. Post Lesson #1 Translate the sentence. 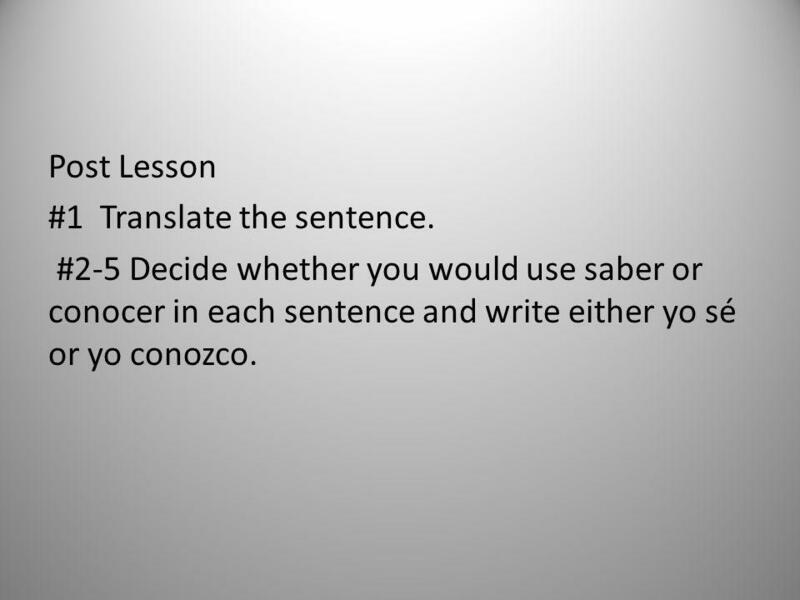 #2-5 Decide whether you would use saber or conocer in each sentence and write either yo sé or yo conozco. 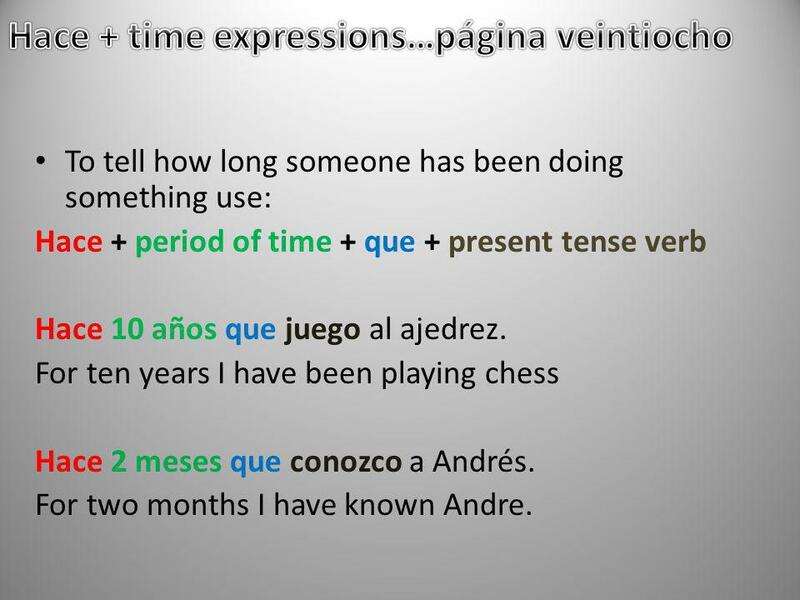 To tell how long someone has been doing something use: Hace + period of time + que + present tense verb Hace 10 años que juego al ajedrez. For ten years I have been playing chess Hace 2 meses que conozco a Andrés. For two months I have known Andre. 74 1.) Think of a sport or any extracurricular activity that you are involved in. 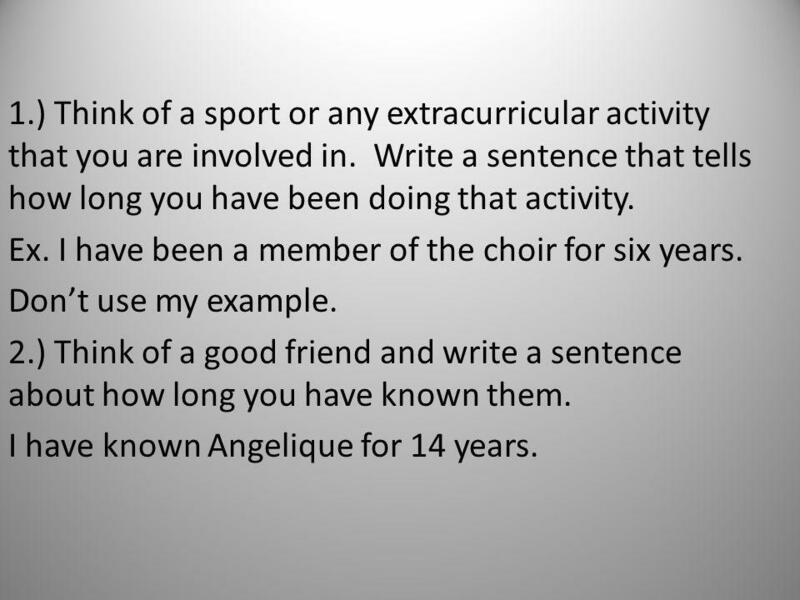 Write a sentence that tells how long you have been doing that activity. Ex. I have been a member of the choir for six years. Don’t use my example. 2.) Think of a good friend and write a sentence about how long you have known them. I have known Angelique for 14 years. Abran su libro en la página noventa y ocho. Copien las palabras en español. 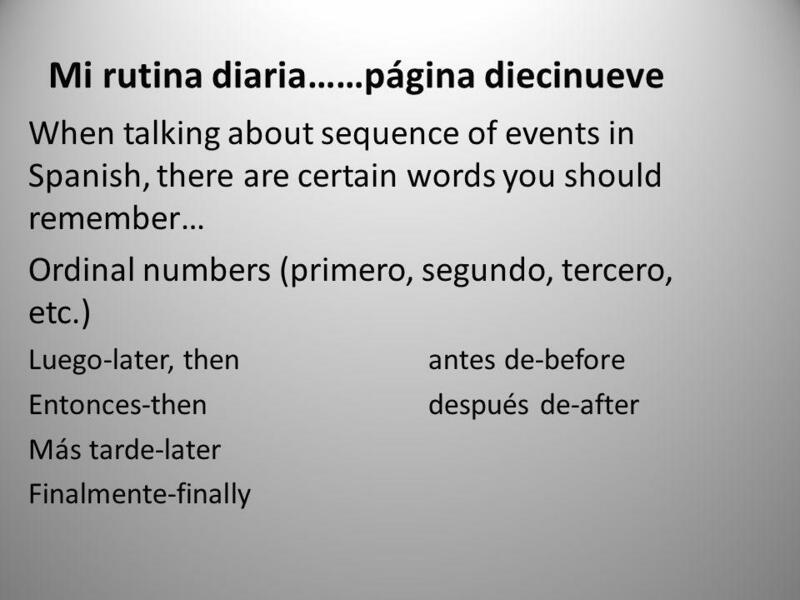 In English we often add –ed to a word to form the past tense (walked, talked, looked). Sometimes we do not add-ed (swam, sang, ate, wrote). 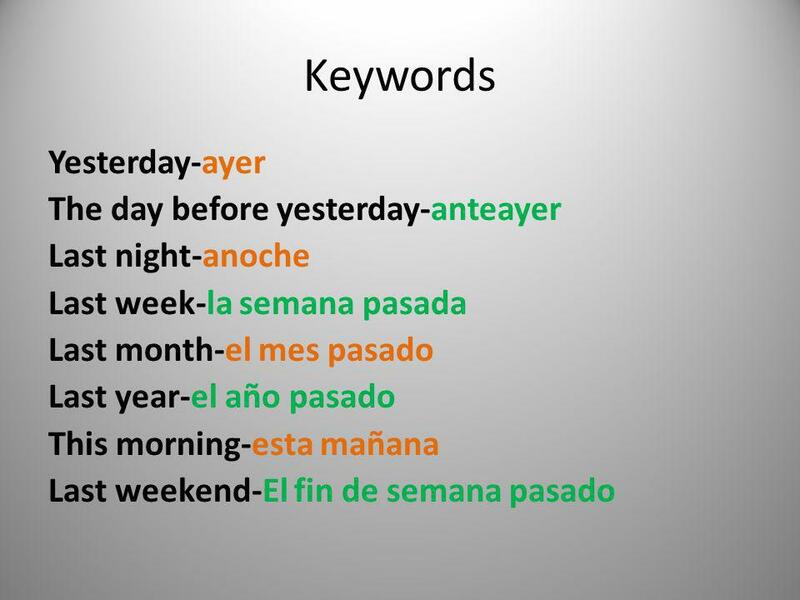 In Spanish, there is a different set of verb endings for the past tense. 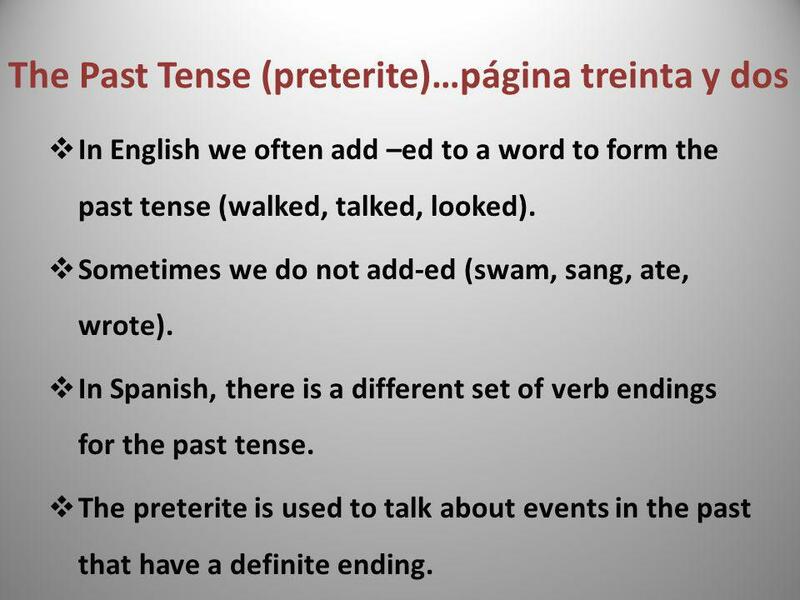 The preterite is used to talk about events in the past that have a definite ending. 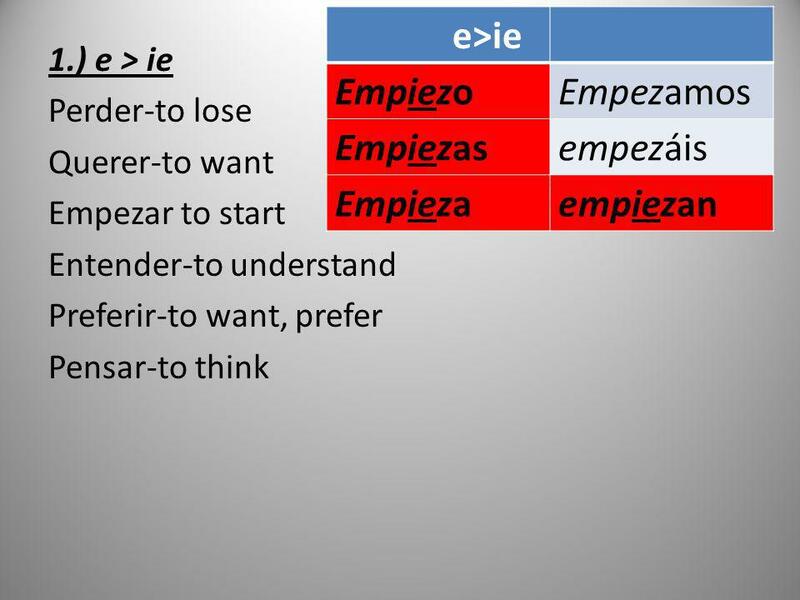 82 Er/ir verb endings all start with “i”. 84 ¡Practicamos! EX: What movie did you watch last month? 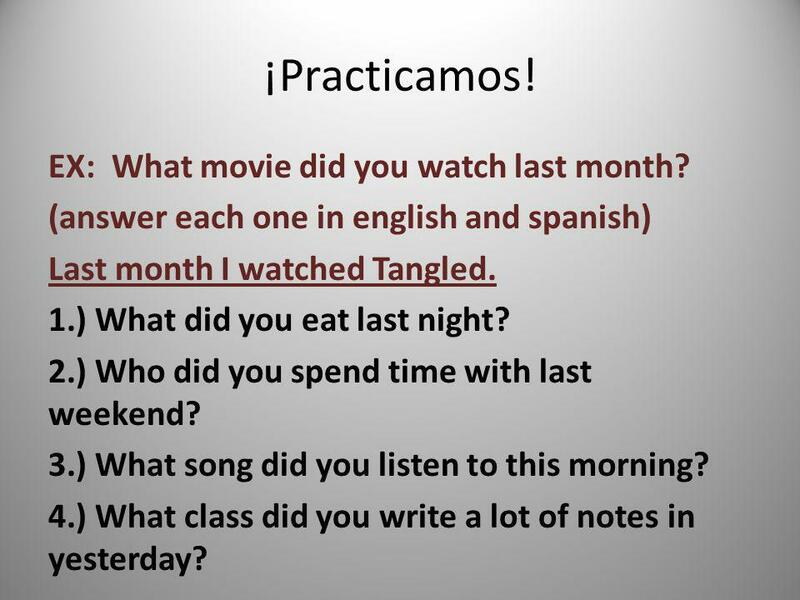 (answer each one in english and spanish) Last month I watched Tangled. 1.) What did you eat last night? 2.) Who did you spend time with last weekend? 3.) What song did you listen to this morning? 4.) What class did you write a lot of notes in yesterday? 88 Practicamos 1. )Draw a car. 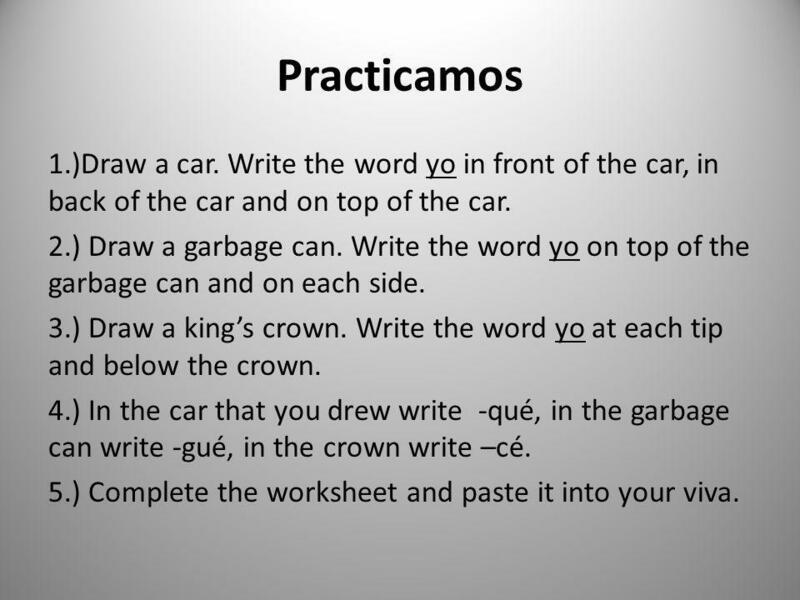 Write the word yo in front of the car, in back of the car and on top of the car. 2.) Draw a garbage can. Write the word yo on top of the garbage can and on each side. 3.) Draw a king’s crown. Write the word yo at each tip and below the crown. 4.) In the car that you drew write -qué, in the garbage can write -gué, in the crown write –cé. 5.) Complete the worksheet and paste it into your viva. 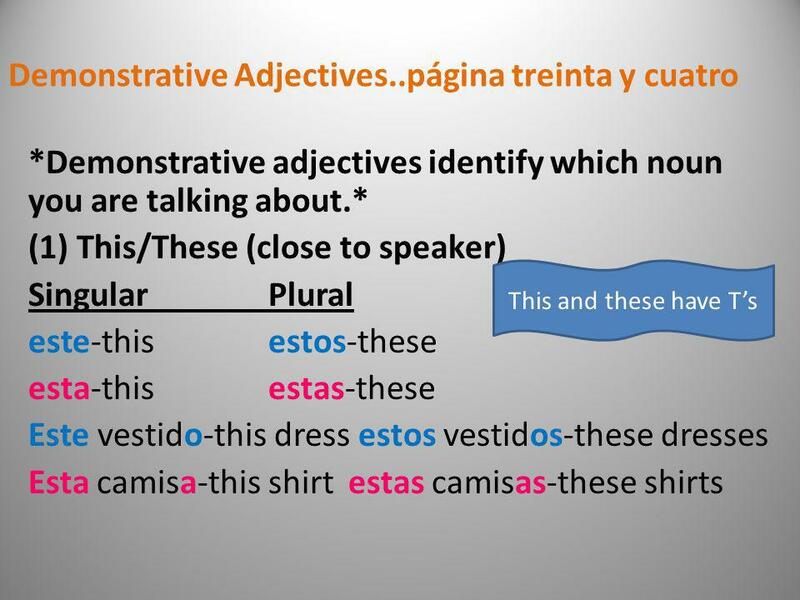 90 Don’t use articles with demonstrative adjectives! 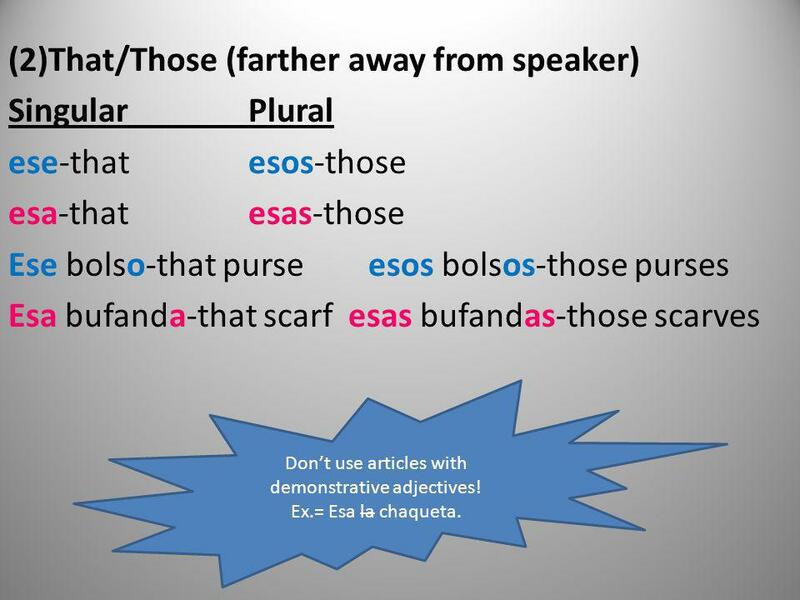 (2)That/Those (farther away from speaker) Singular Plural ese-that esos-those esa-that esas-those Ese bolso-that purse esos bolsos-those purses Esa bufanda-that scarf esas bufandas-those scarves Don’t use articles with demonstrative adjectives! Ex.= Esa la chaqueta. 92 Draw any article of clothing big, then a little smaller, and finally very small. Color each one a different color. 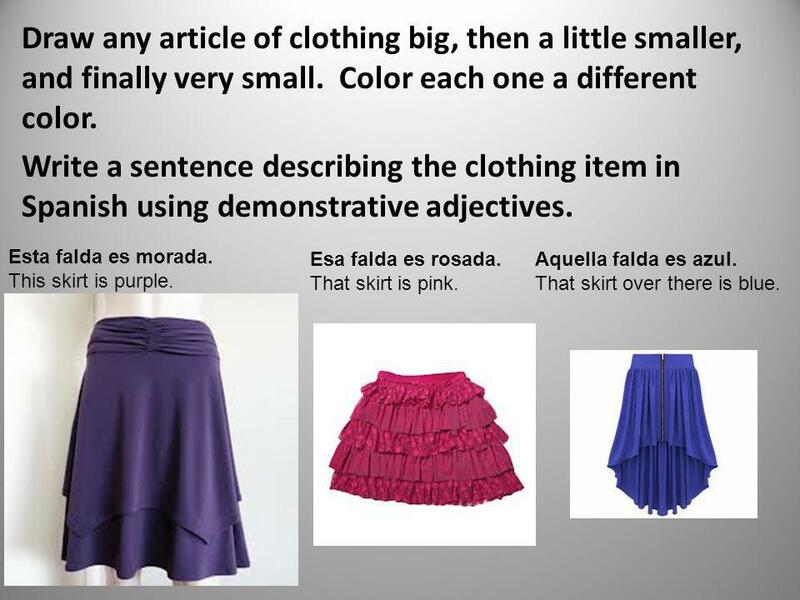 Write a sentence describing the clothing item in Spanish using demonstrative adjectives. Esta falda es morada. This skirt is purple. Esa falda es rosada. That skirt is pink. Aquella falda es azul. That skirt over there is blue. 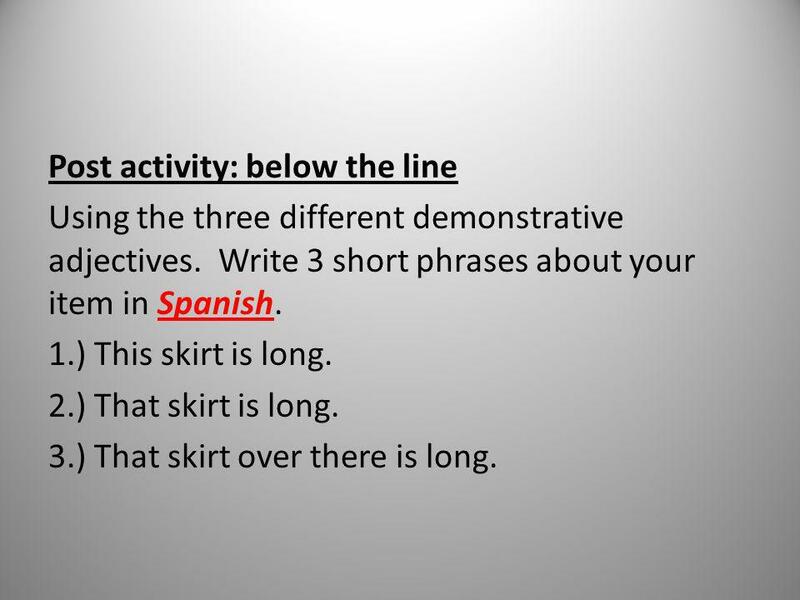 93 Post activity: below the line Using the three different demonstrative adjectives. 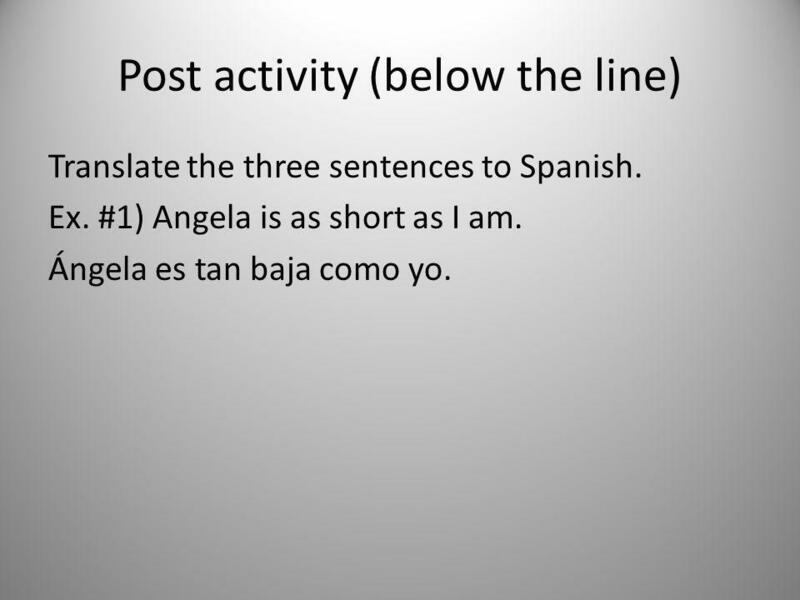 Write 3 short phrases about your item in Spanish. 1.) This skirt is long. 2.) That skirt is long. 3.) That skirt over there is long. 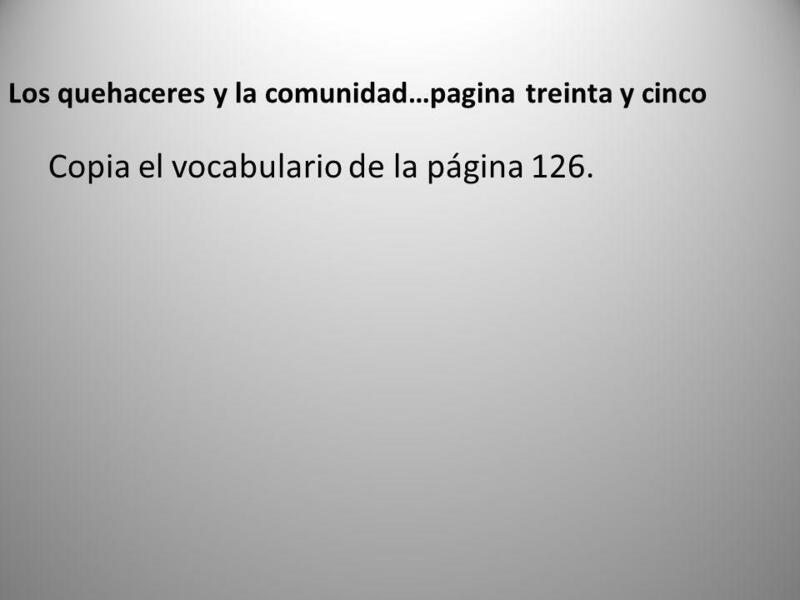 Copia el vocabulario de la página 126. Between :01 and :30 use the word y to tell the time. 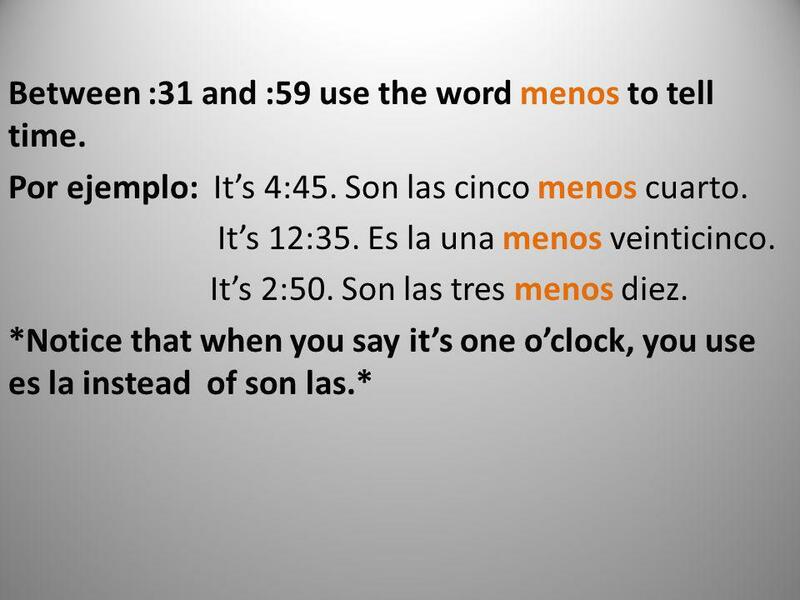 Por ejemplo: It’s 2:20- Son las dos y veinte. It’s 11:30-Son las once y media. (media-half) It’s 5:15-Son las cinco y cuarto . (cuarto-quarter) La medianoche-midnight Es la medianoche. It’s midnight. 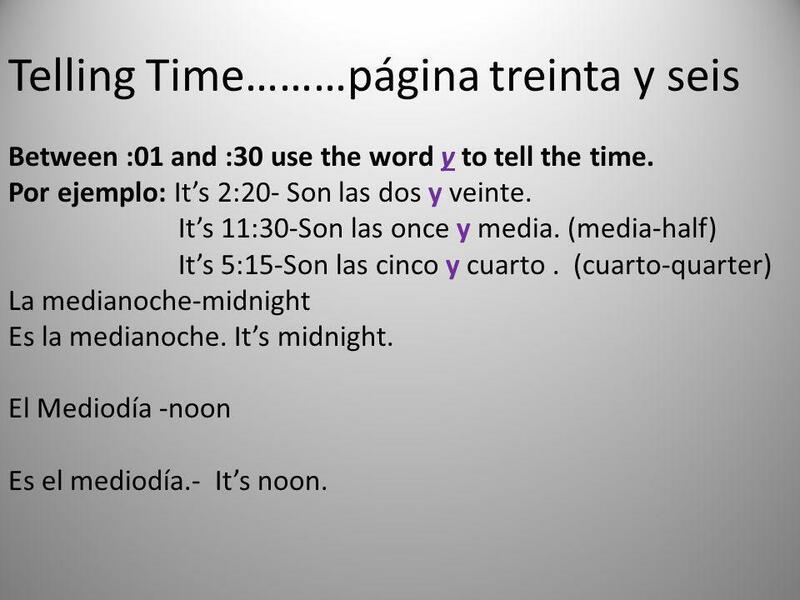 El Mediodía -noon Es el mediodía.- It’s noon. ¿Qué hora es?- What time is it? 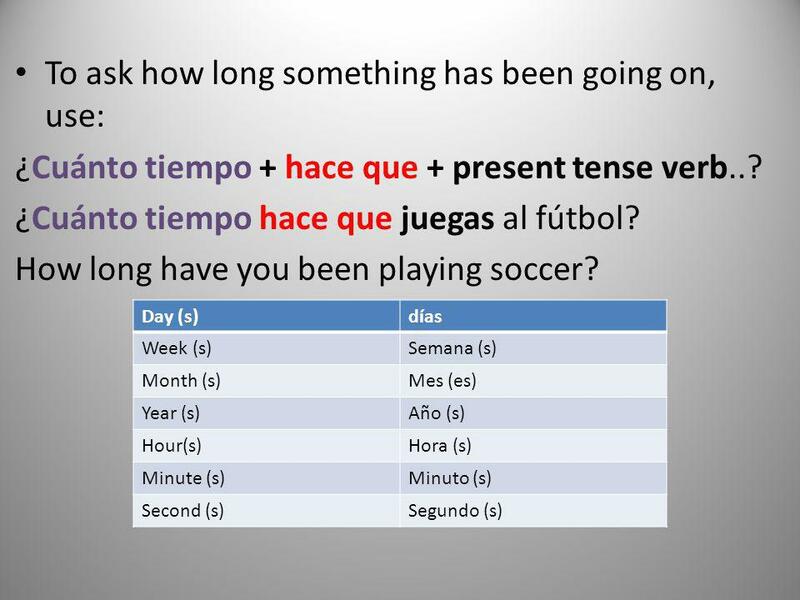 (currently) (Answer like the previous slides, using es la or son las.) 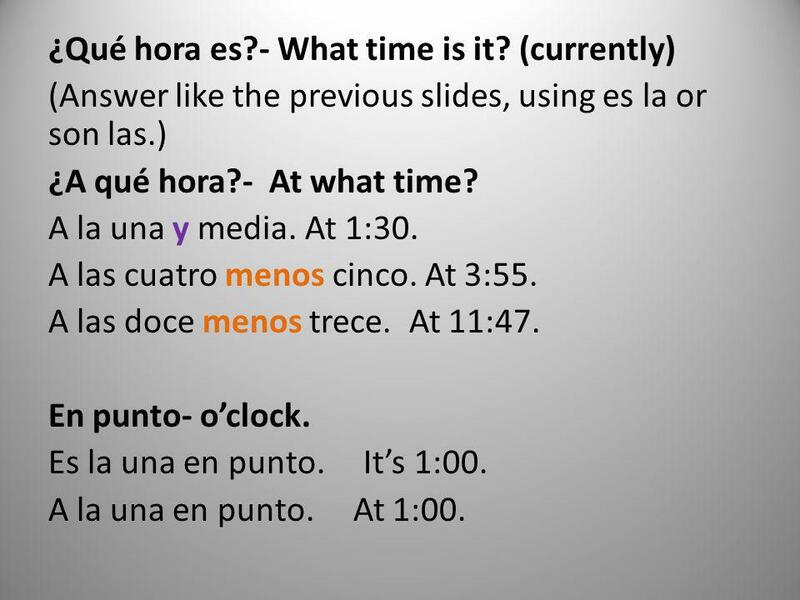 ¿A qué hora?- At what time? A la una y media. At 1:30. A las cuatro menos cinco. At 3:55. A las doce menos trece. At 11:47. En punto- o’clock. Es la una en punto. It’s 1:00. A la una en punto. At 1:00. 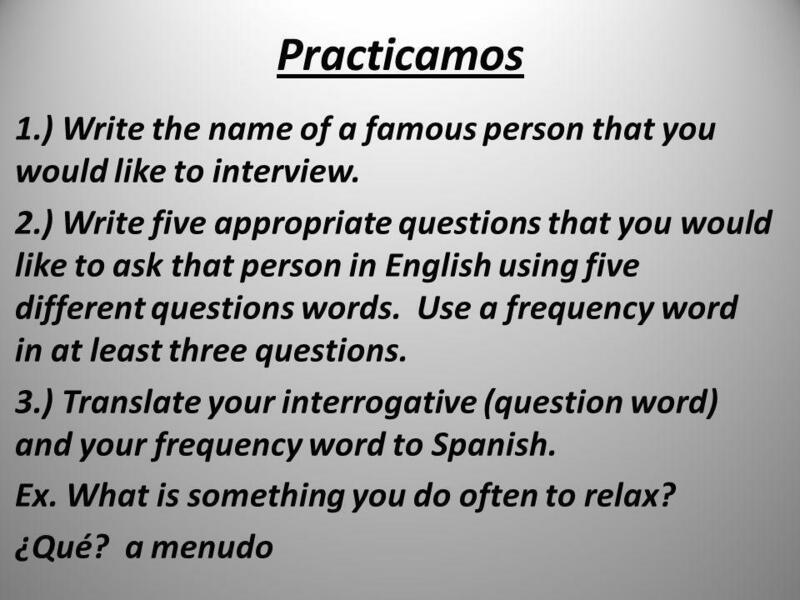 99 Practicamos Answer the following questions in English, then translate. 1.) What time did you go to bed last night? Ex. I went to bed at 9:45pm. Me acosté a las diez menos cuarto. 2.) What time did you wake up this morning? 3.) What time do you eat lunch at school? 4.) 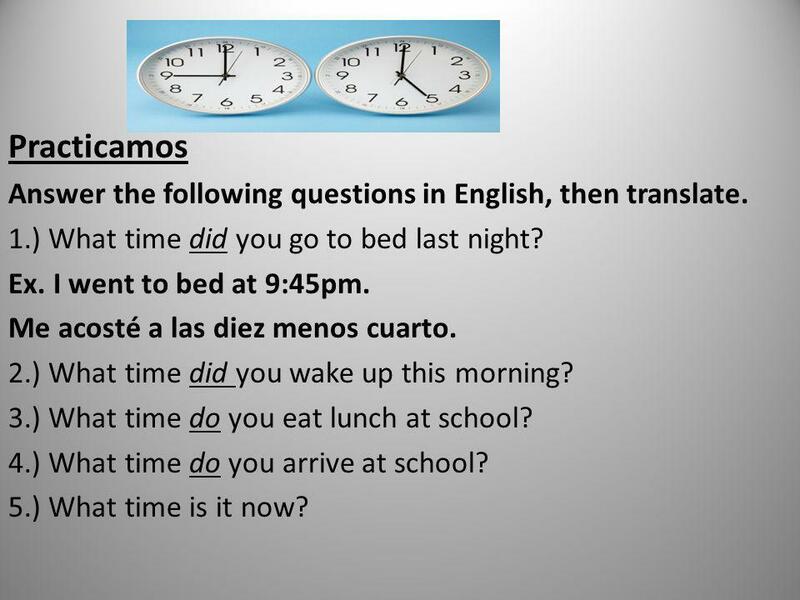 What time do you arrive at school? 5.) What time is it now? 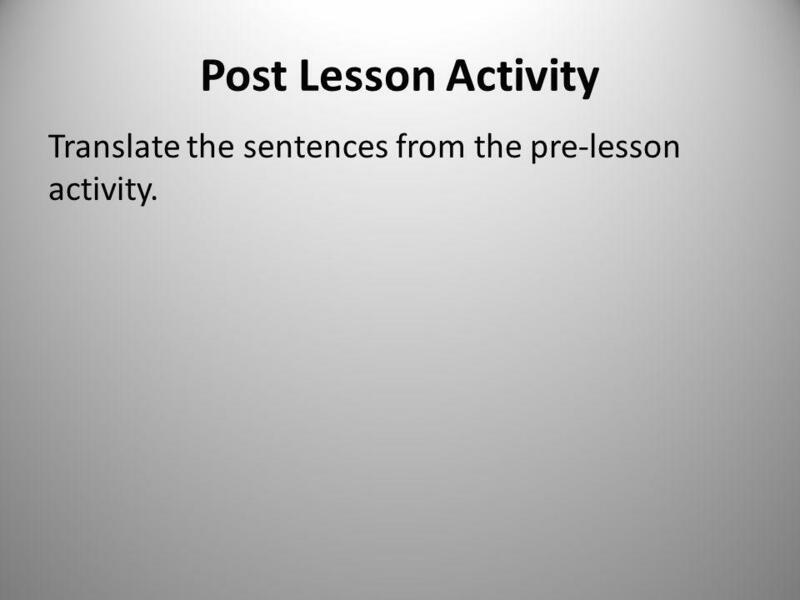 100 Post Lesson Activity Translate the sentences from the pre-lesson activity. 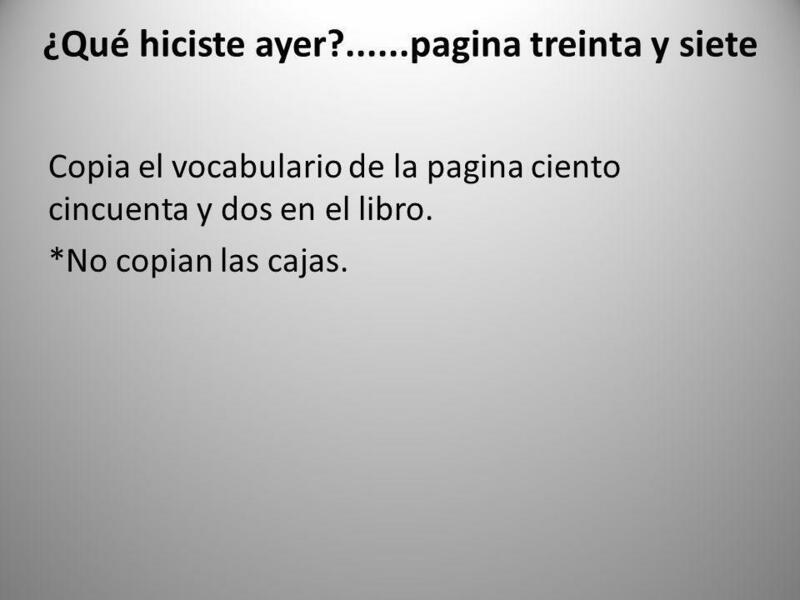 Copia el vocabulario de la pagina ciento cincuenta y dos en el libro. *No copian las cajas. 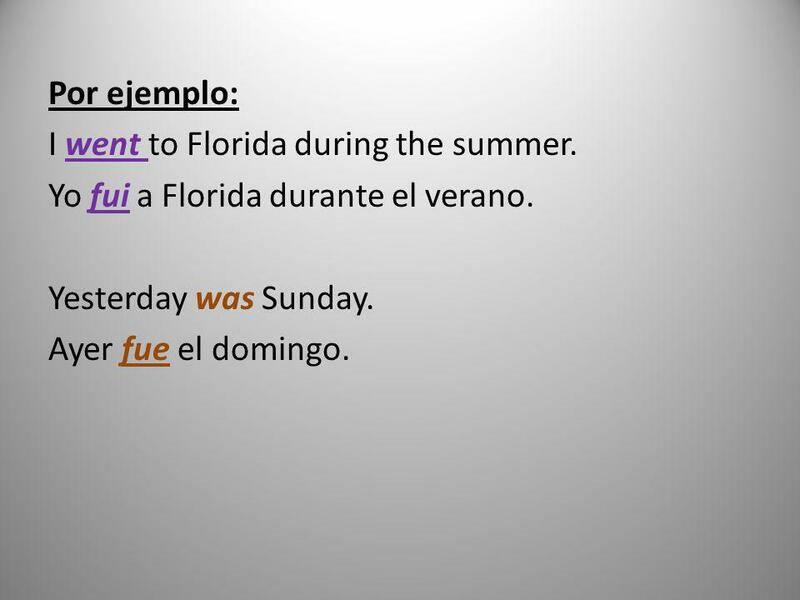 Por ejemplo: I went to Florida during the summer. Yo fui a Florida durante el verano. Yesterday was Sunday. Ayer fue el domingo. 104 ¡Practicamos! 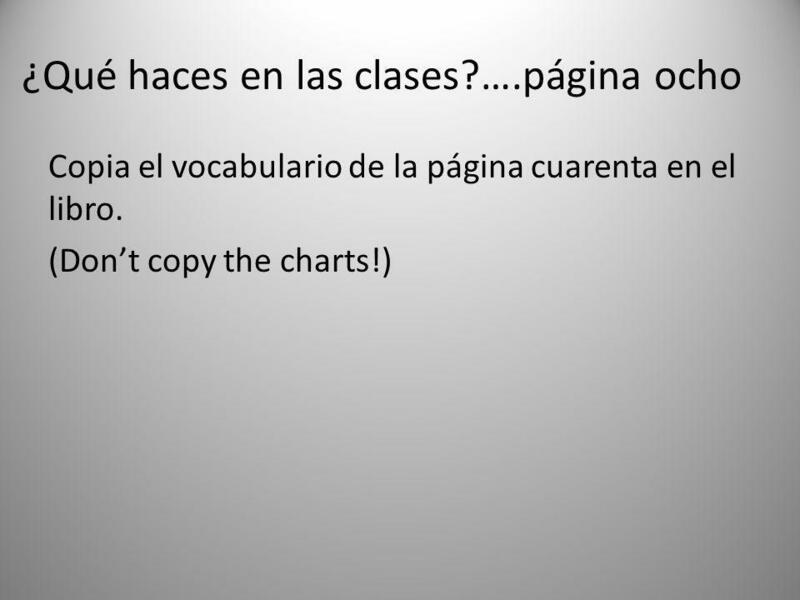 Answer the questions in English and Spanish: 1.) What elementary school did you go to? I went to…. 2.) What restaurant did you go to last with your friends or family? We went to…. 3.) How was the food at that restaurant? It was…. 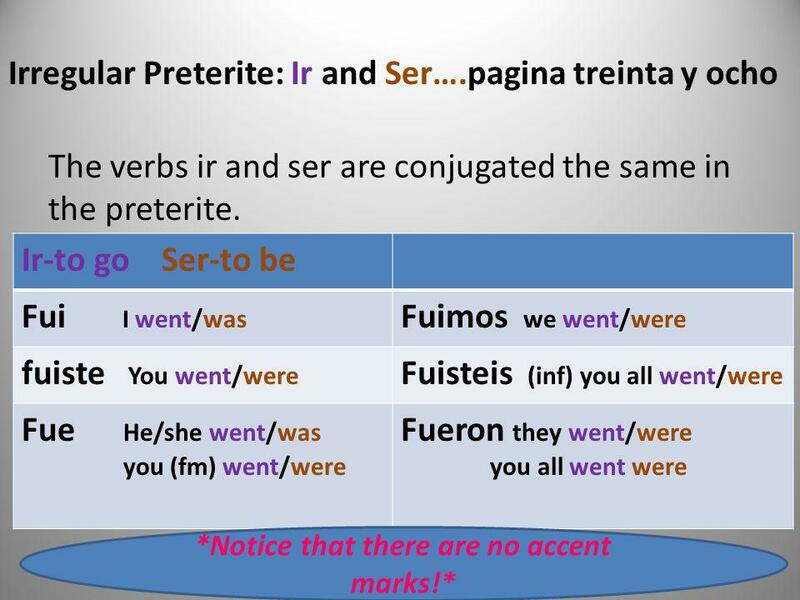 106 None of these verbs have accent marks! 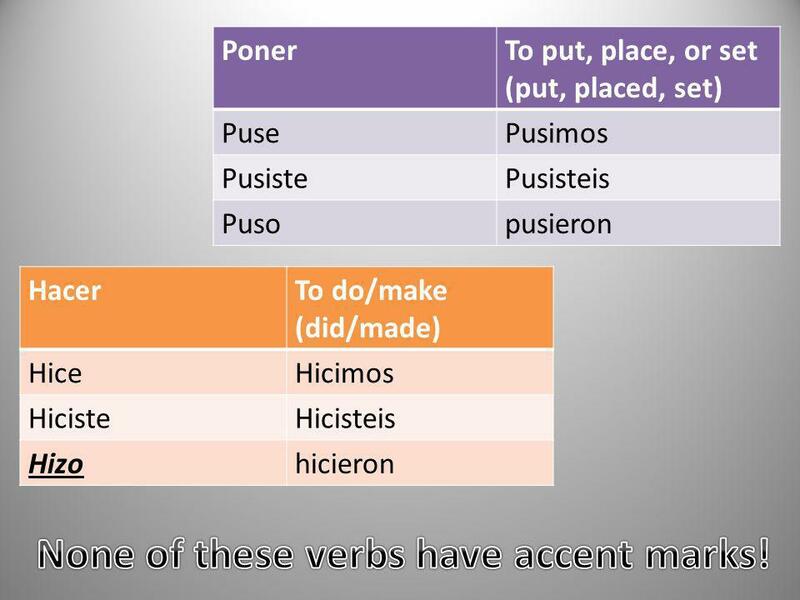 Poner To put, place, or set (put, placed, set) Puse Pusimos Pusiste Pusisteis Puso pusieron Hacer To do/make (did/made) Hice Hicimos Hiciste Hicisteis Hizo hicieron None of these verbs have accent marks! 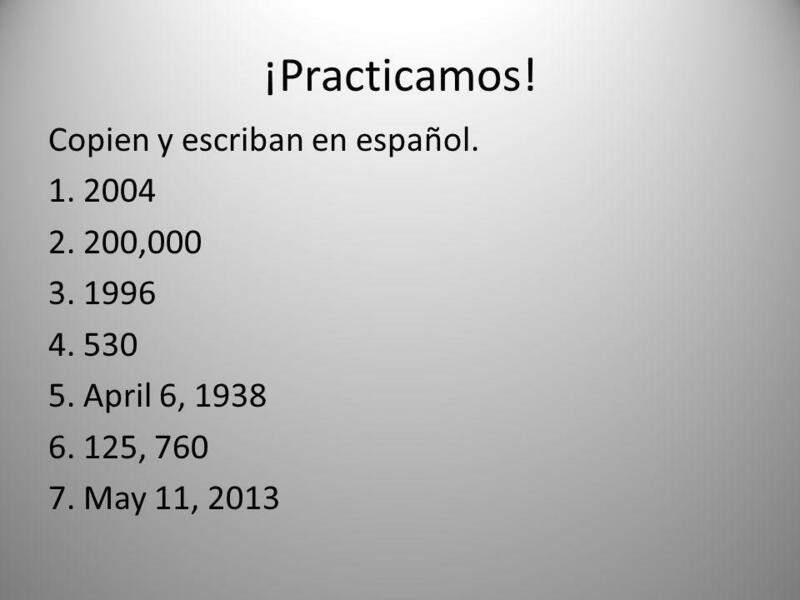 107 ¡Practicamos! 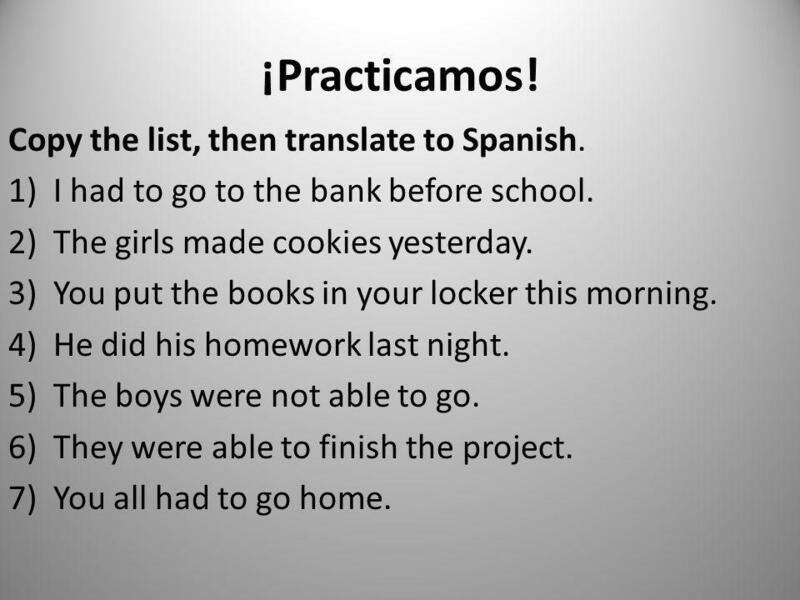 Copy the list, then translate to Spanish. I had to go to the bank before school. The girls made cookies yesterday. You put the books in your locker this morning. He did his homework last night. The boys were not able to go. They were able to finish the project. You all had to go home. 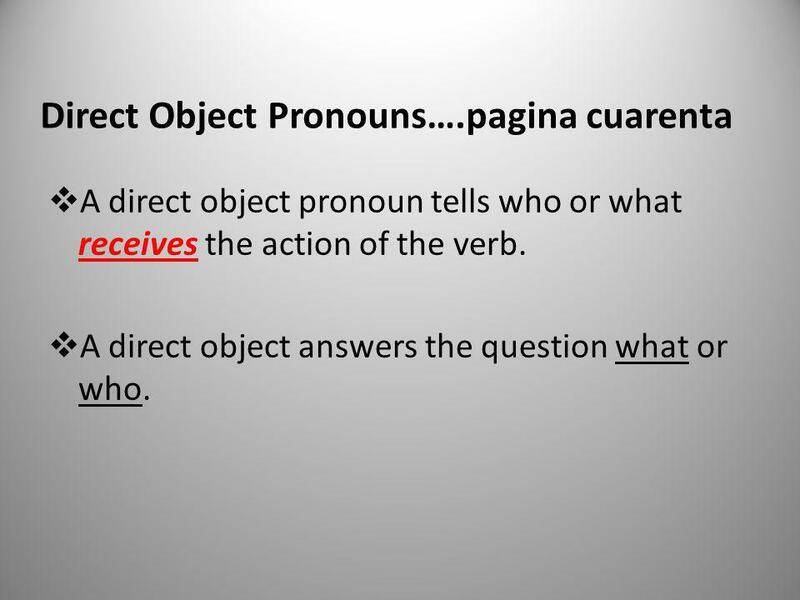 A direct object pronoun tells who or what receives the action of the verb. A direct object answers the question what or who. 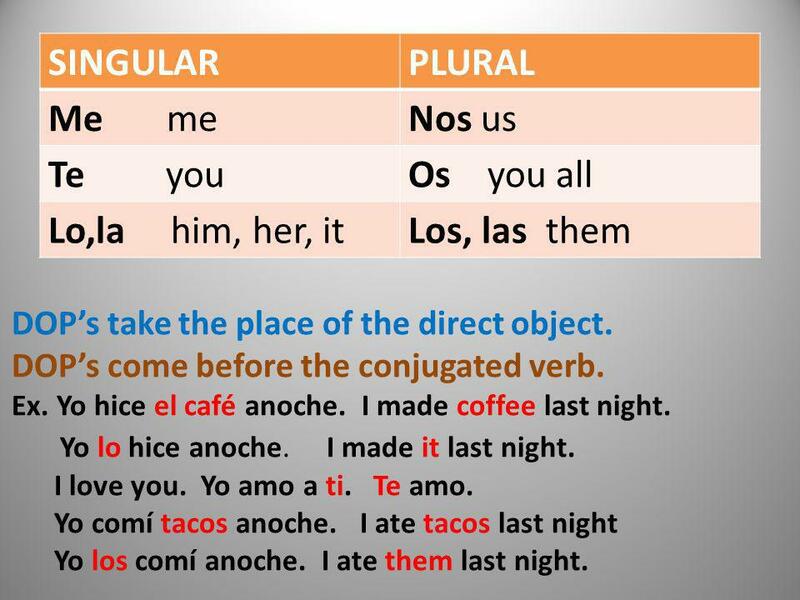 Los, las them DOP’s take the place of the direct object. DOP’s come before the conjugated verb. Ex. Yo hice el café anoche. I made coffee last night. Yo lo hice anoche. I made it last night. I love you. Yo amo a ti. Te amo. Yo comí tacos anoche. I ate tacos last night Yo los comí anoche. I ate them last night. 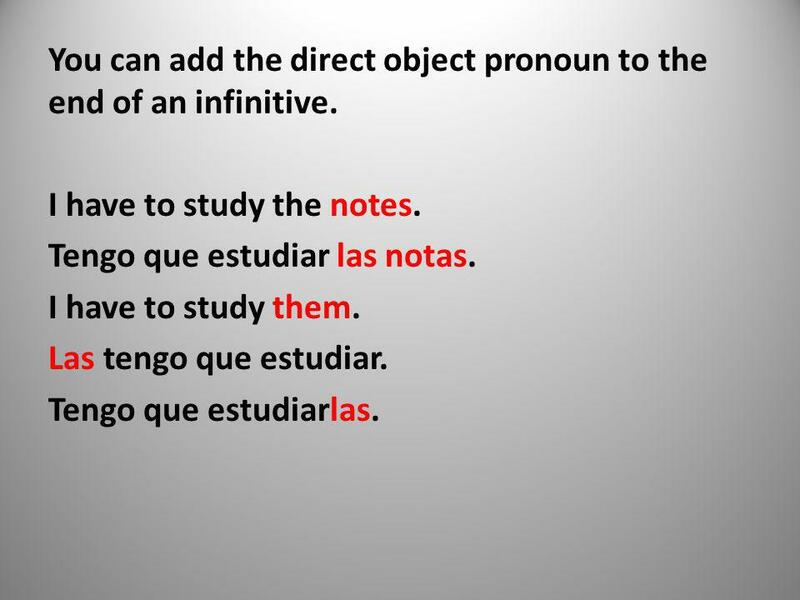 You can add the direct object pronoun to the end of an infinitive. I have to study the notes. Tengo que estudiar las notas. I have to study them. Las tengo que estudiar. Tengo que estudiarlas. 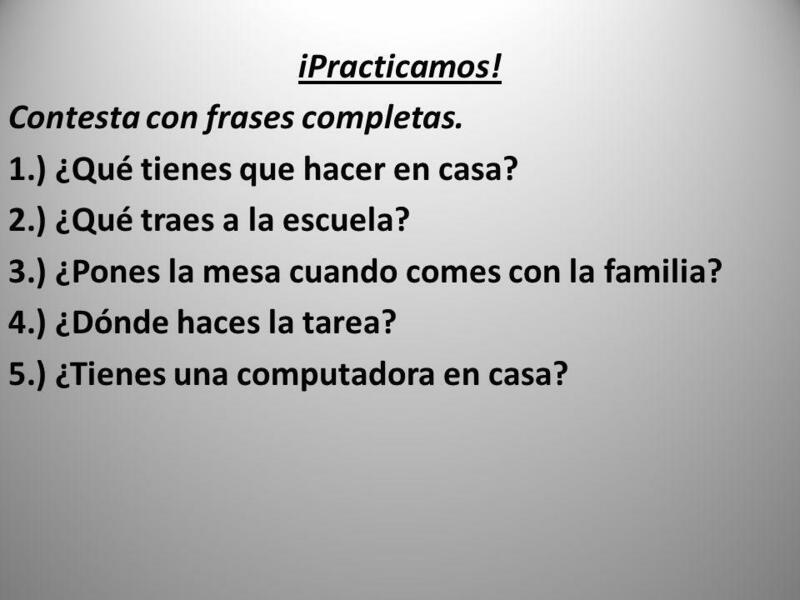 111 ¡Practicamos! Ex. El pelo el regalo el libro la camisa el carro/coche el desodorante 2.) 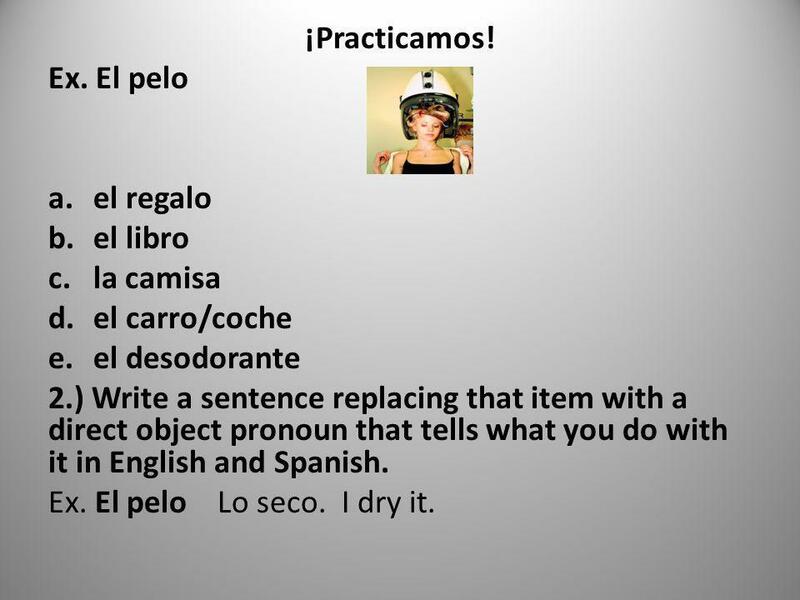 Write a sentence replacing that item with a direct object pronoun that tells what you do with it in English and Spanish. Ex. El pelo Lo seco. I dry it. 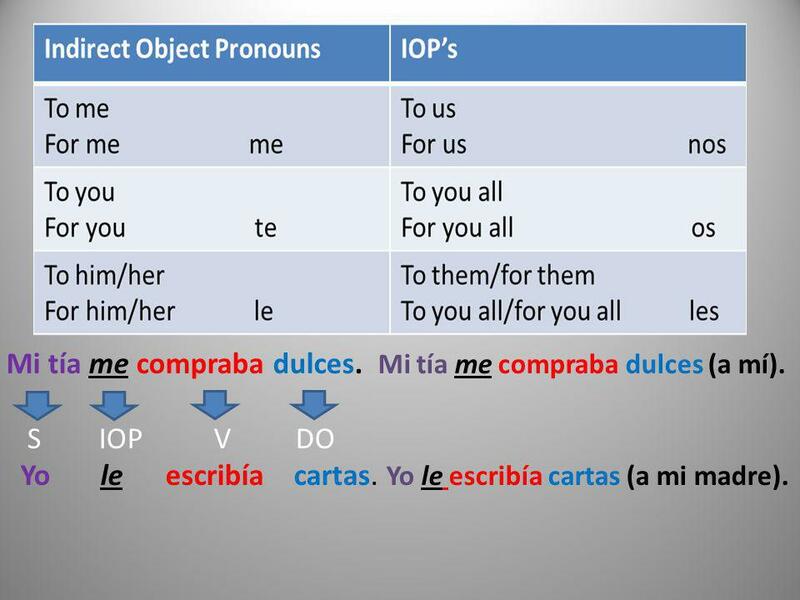 Write the name of the object in English and Spanish. 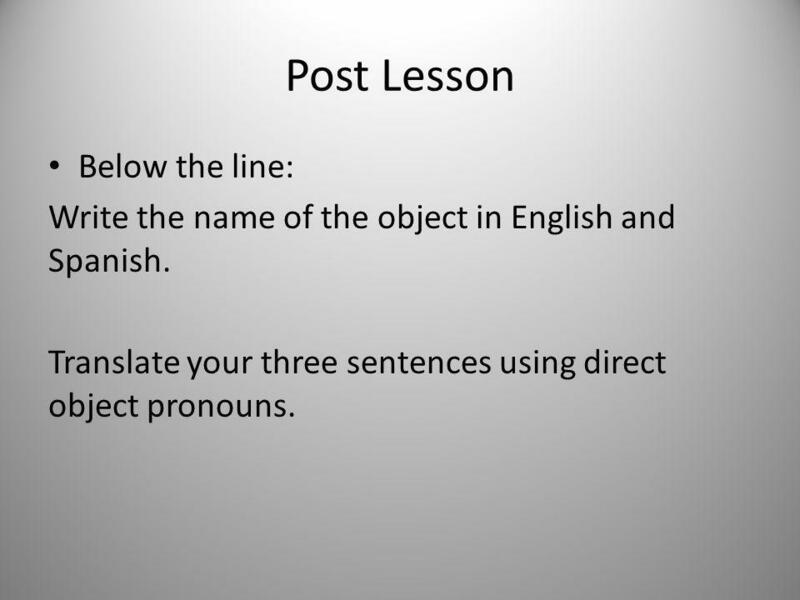 Translate your three sentences using direct object pronouns. 115 2.) 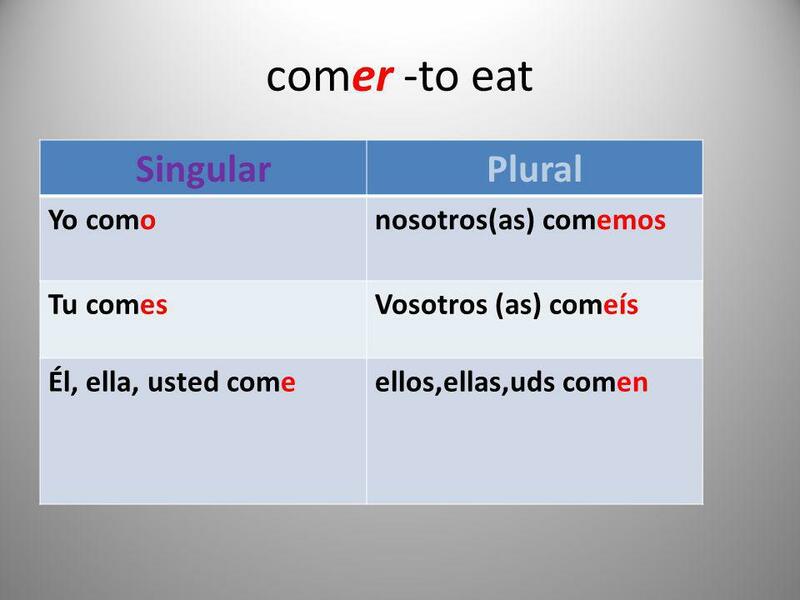 stem of the verb that is happening right now: Comer=com Estudiar-estudi Doblar-dobl 3.) 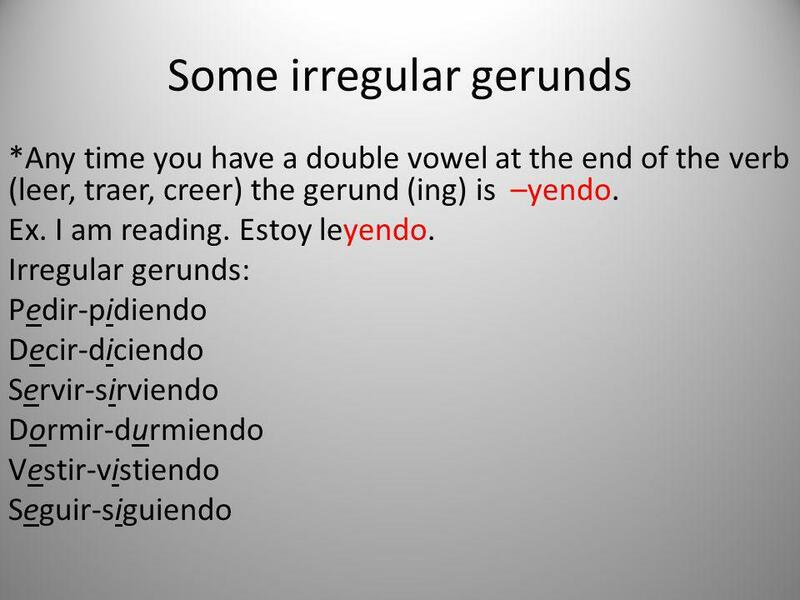 Gerund (-ing) Verbs that end in –ar=ando Verbs that end in –er/ir=iendo Ex. Estoy comiendo. I am eating Estás estudiando. You are studying. Está doblando. He is turning. 117 ¡Practicamos! 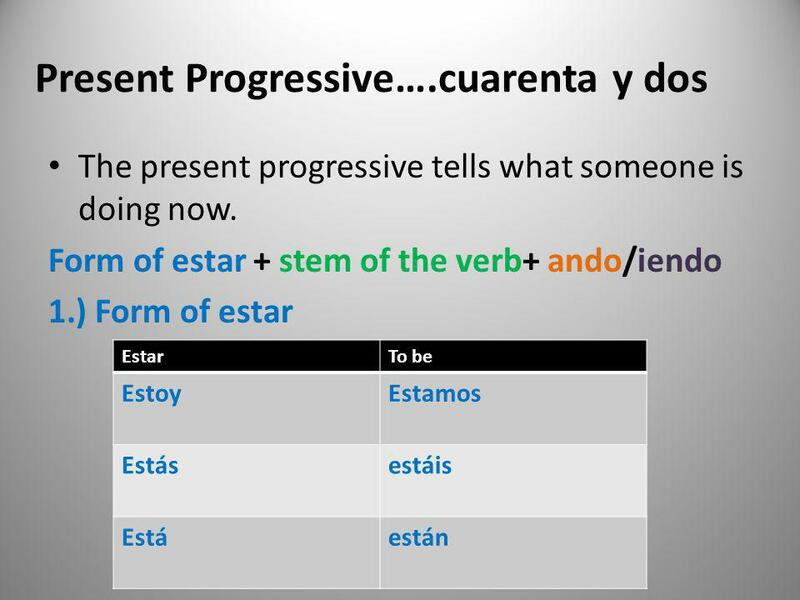 Answer the questions in English and Spanish in a complete sentence using the present progressive. 1.) 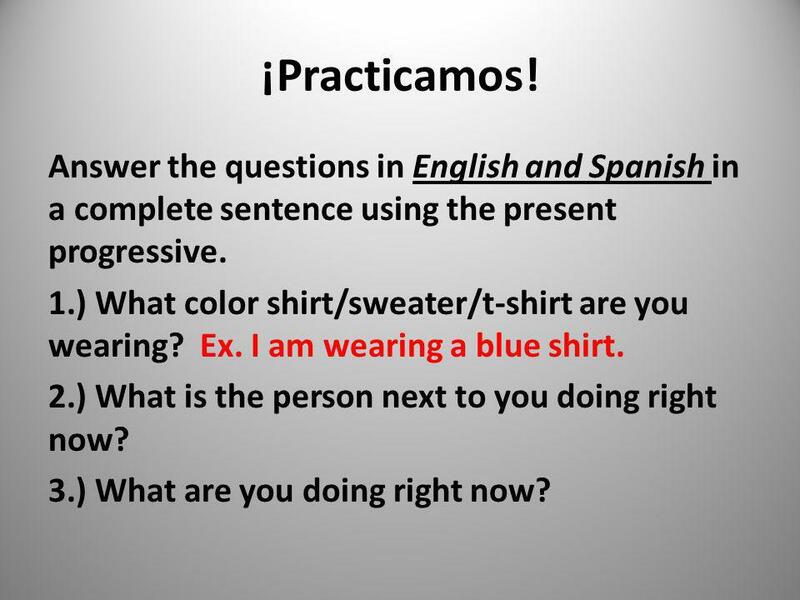 What color shirt/sweater/t-shirt are you wearing? Ex. I am wearing a blue shirt. 2.) What is the person next to you doing right now? 3.) What are you doing right now? A command is used to tell someone to do something. To form a command for most verbs… 1. 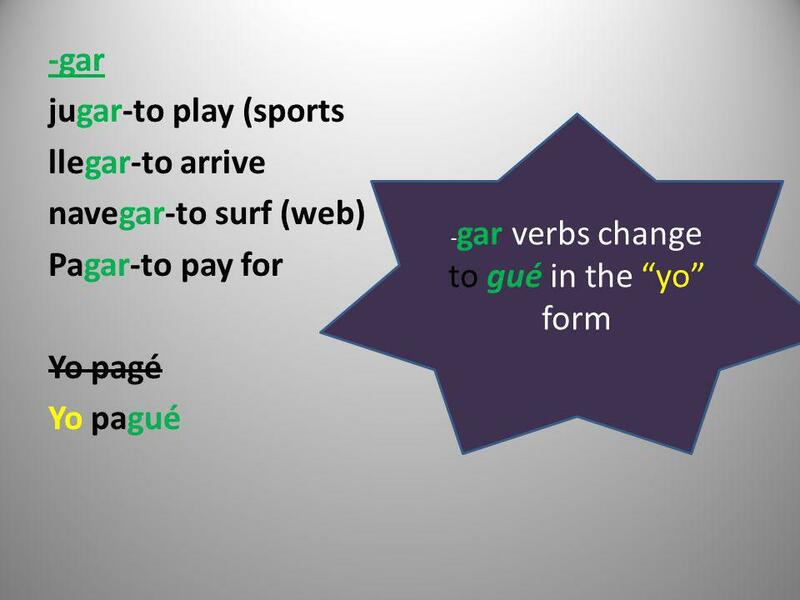 )Put the verb in the él, ella form. Por ejemplo: Turn right. Dobla a la derecha. Open the door. Abre la puerta. Venir-to come=Ven	Ven aqui. 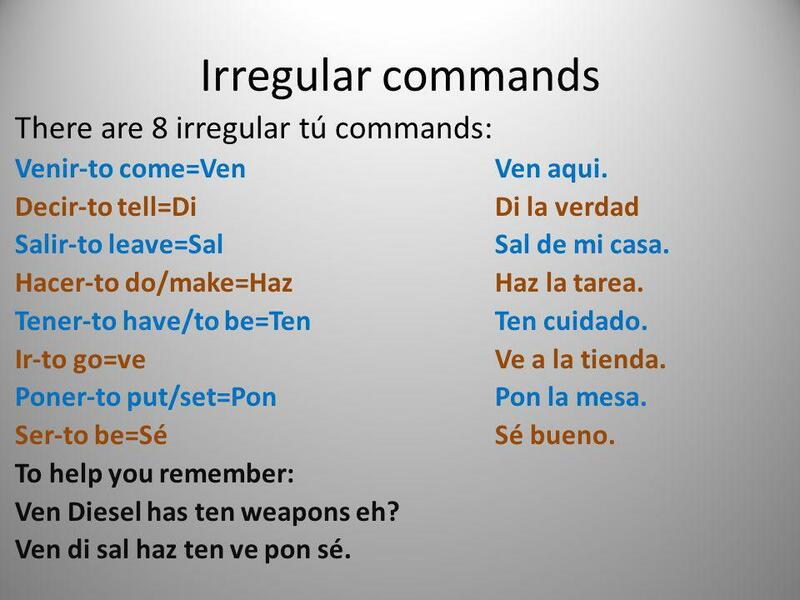 Decir-to tell=Di	Di la verdad Salir-to leave=Sal	Sal de mi casa. 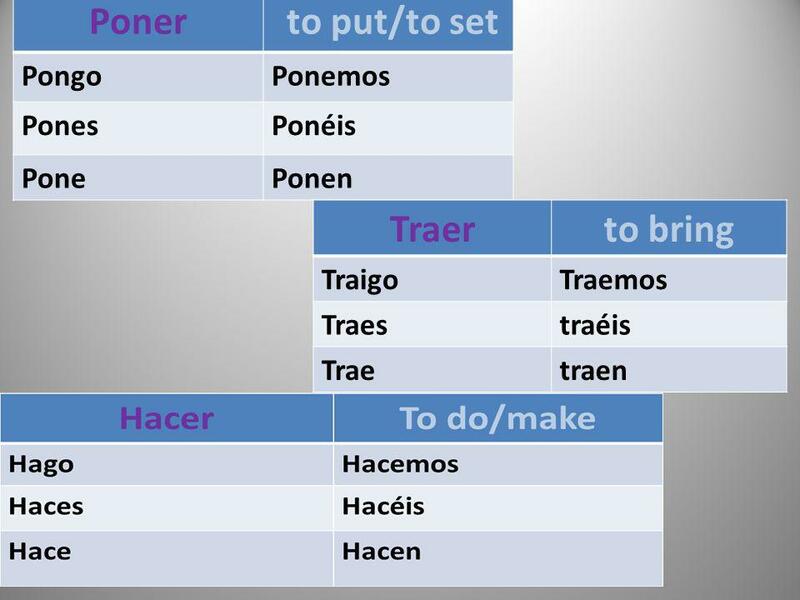 Hacer-to do/make=Haz	Haz la tarea. 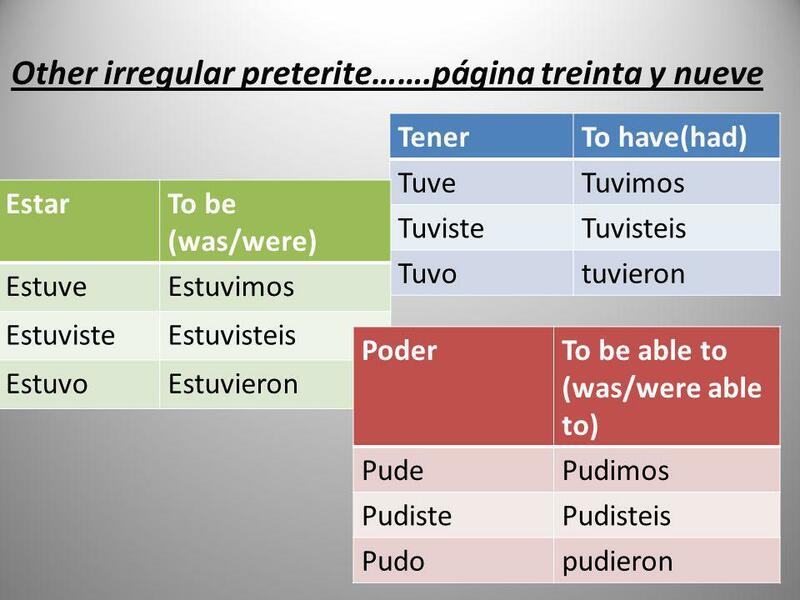 Tener-to have/to be=Ten	Ten cuidado. 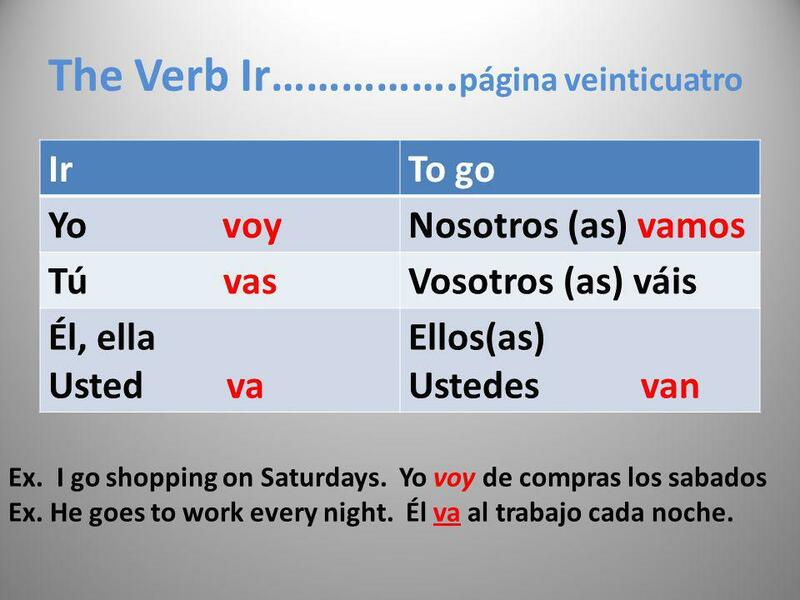 Ir-to go=ve	Ve a la tienda. 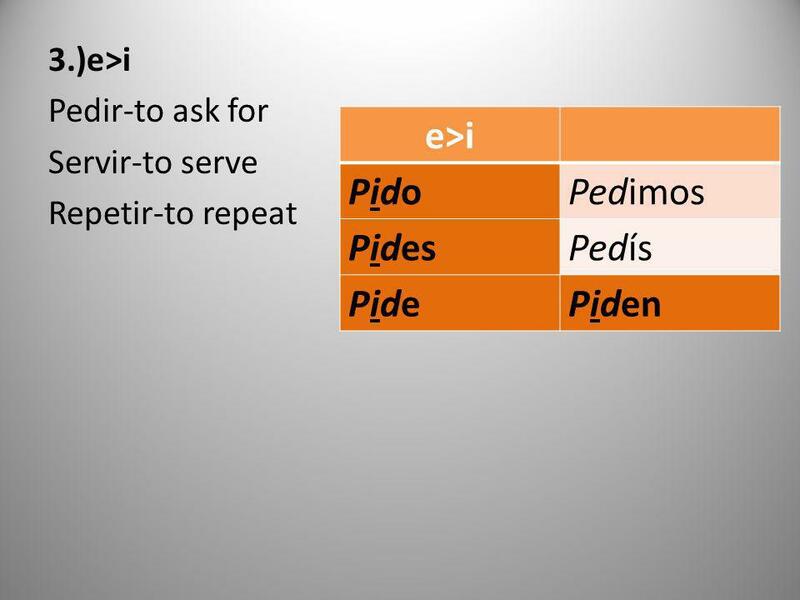 Poner-to put/set=Pon	Pon la mesa. 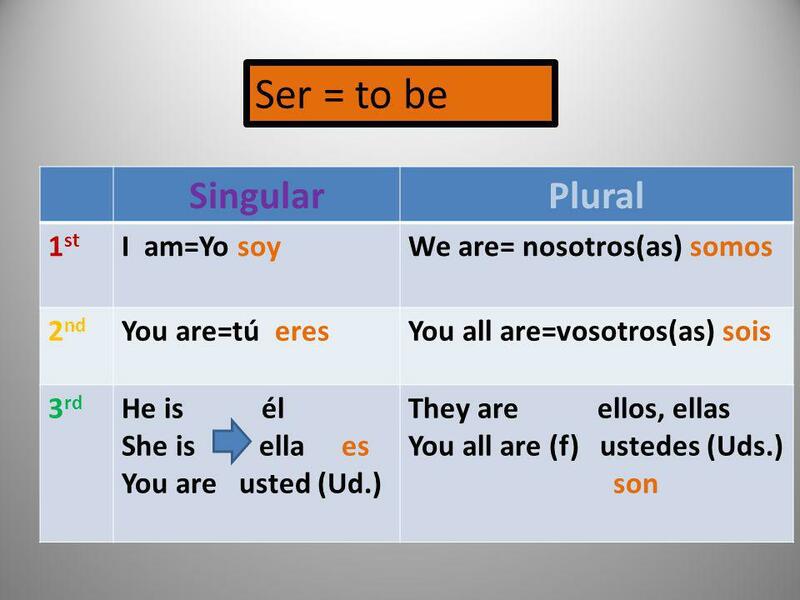 Ser-to be=Sé	Sé bueno. To help you remember: Ven Diesel has ten weapons eh? Ven di sal haz ten ve pon sé. 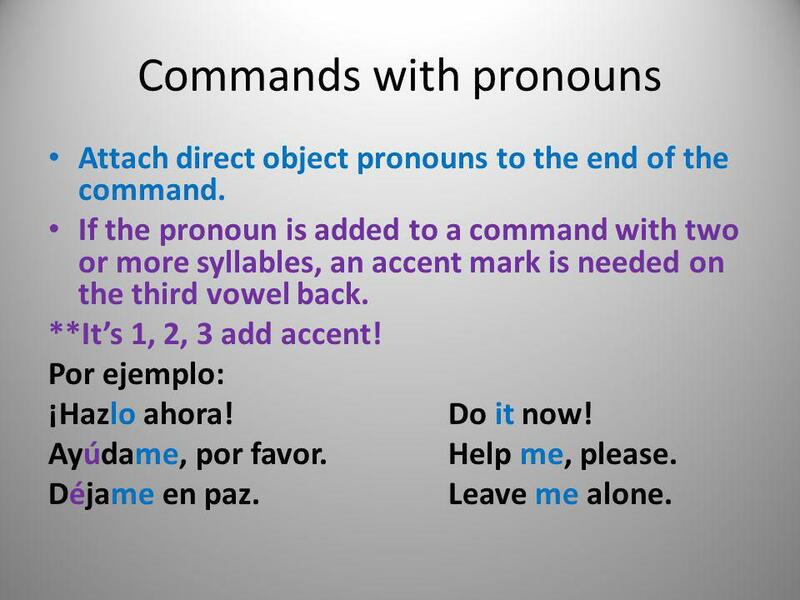 Attach direct object pronouns to the end of the command. 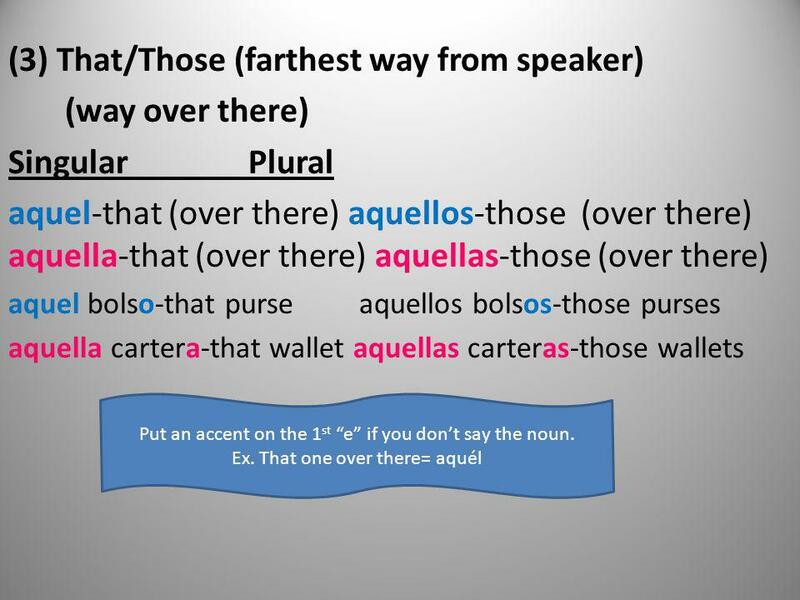 If the pronoun is added to a command with two or more syllables, an accent mark is needed on the third vowel back. **It’s 1, 2, 3 add accent! Por ejemplo: ¡Hazlo ahora! Do it now! Ayúdame, por favor. Help me, please. Déjame en paz. Leave me alone. 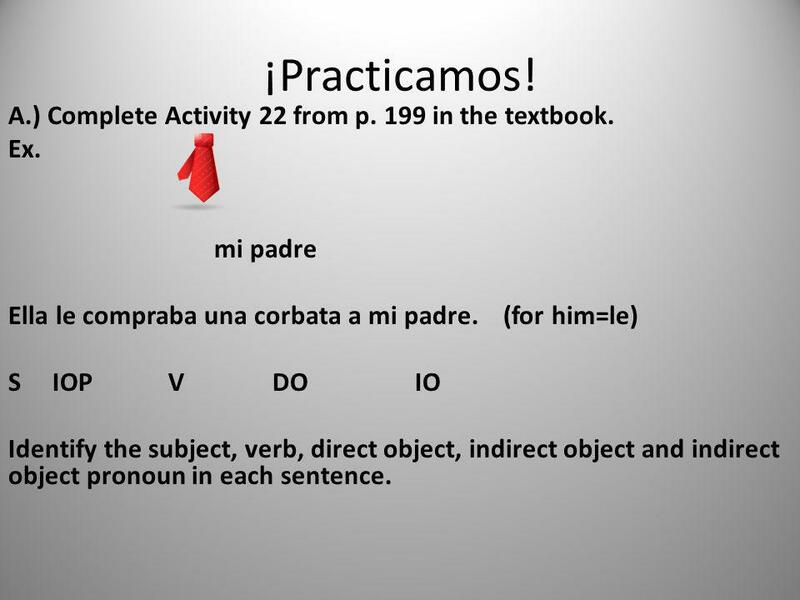 121 ¡Practicamos! 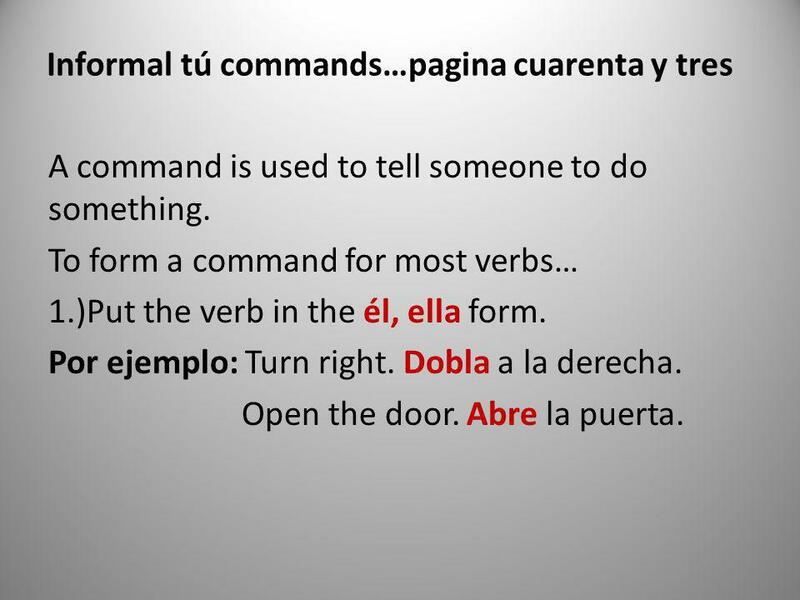 Write these common commands in Spanish using your notes as a model. 1.) Listen. 2.) Speak. 3.) Stop. 4.) Wait. 5.) 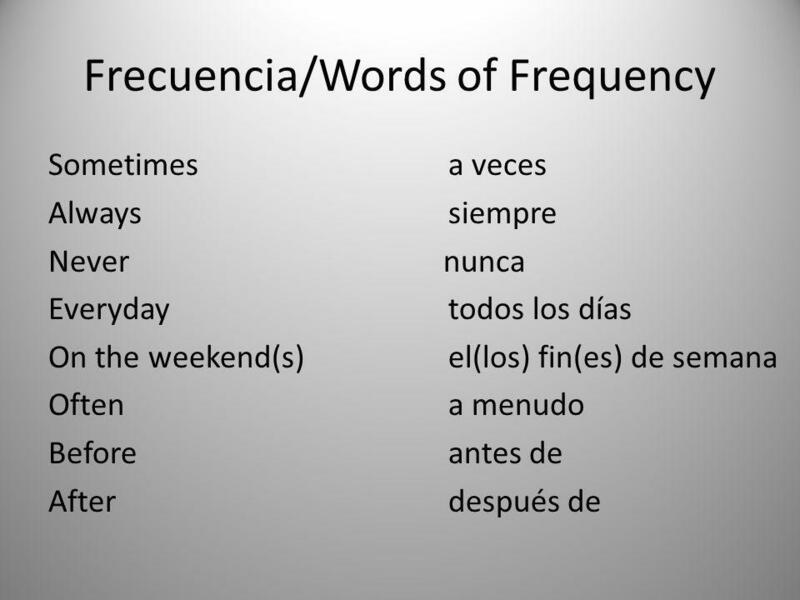 Repeat the vocabulary. 6.) Pass the papers to the front. 7.) Turn left.